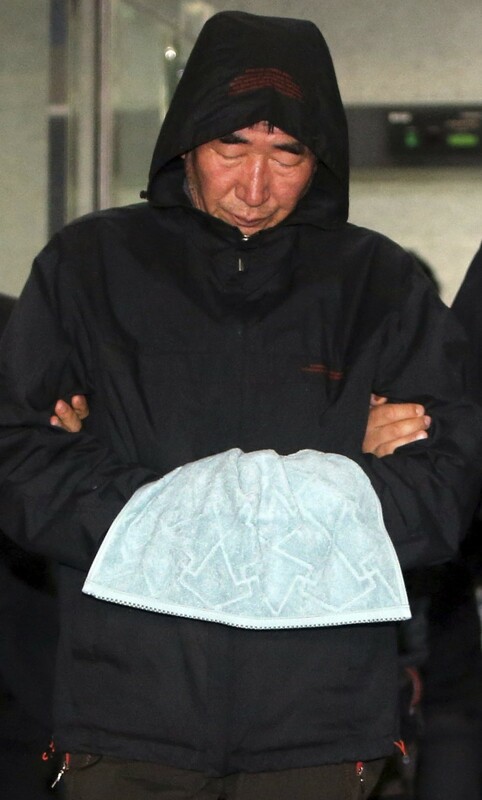 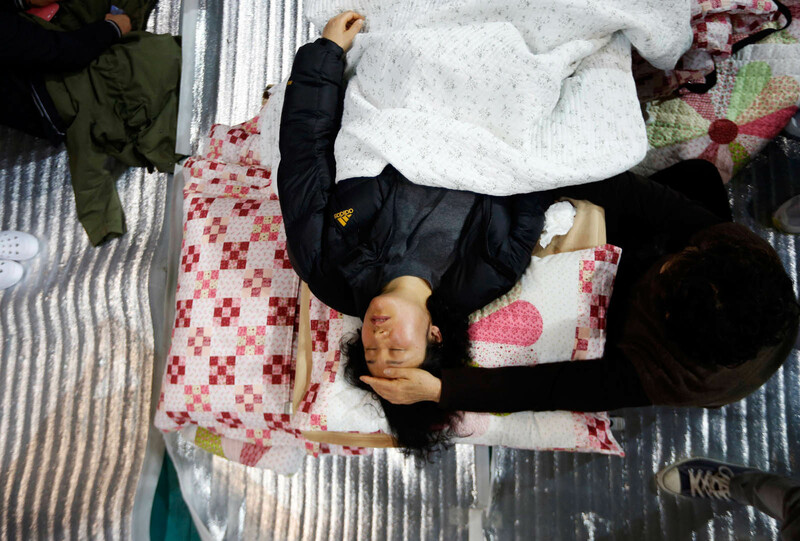 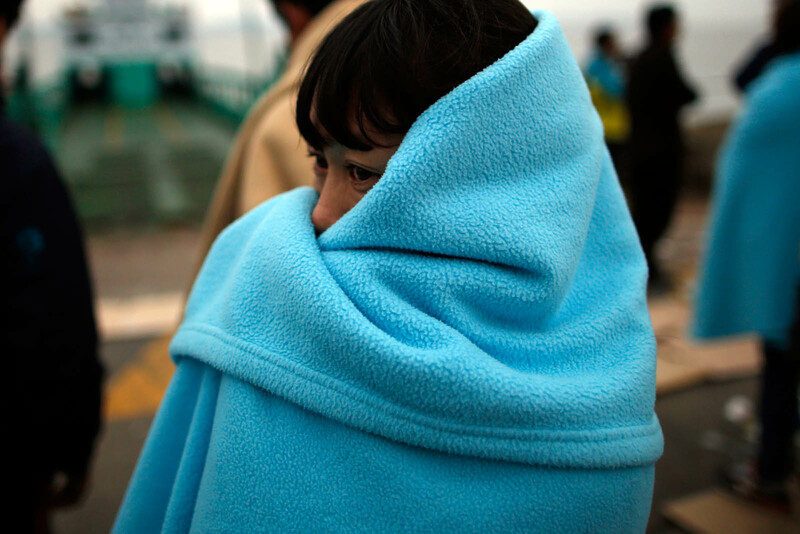 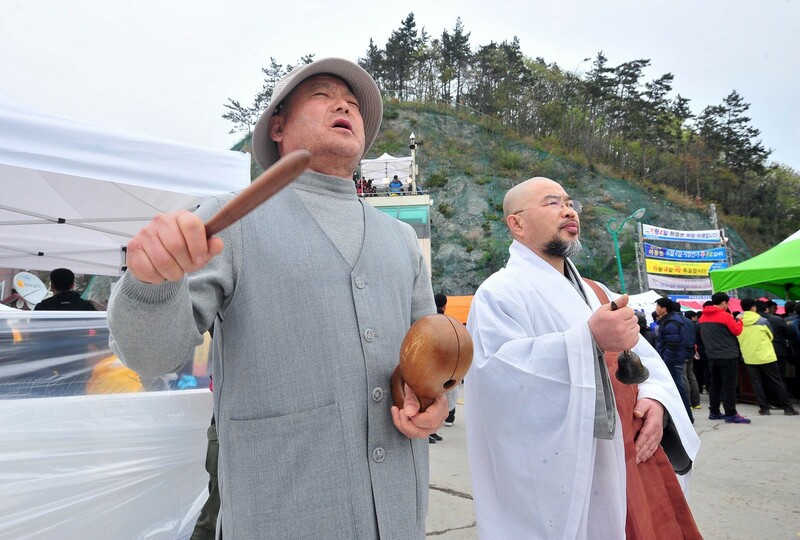 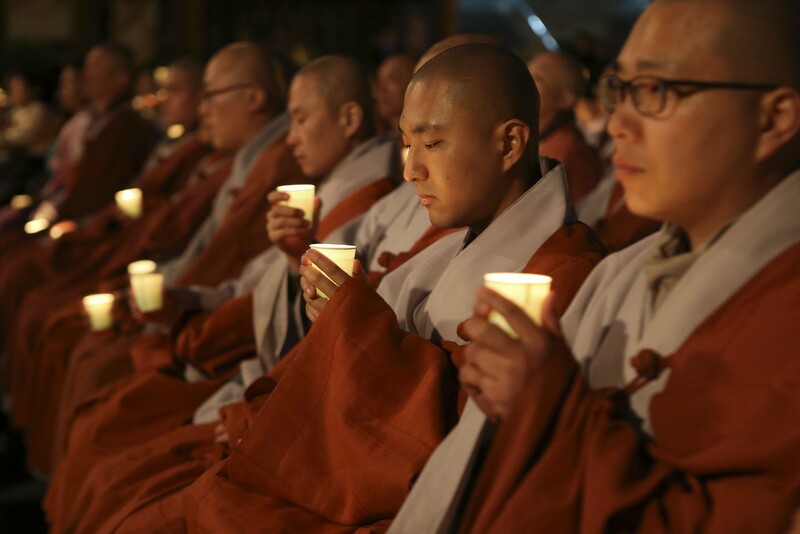 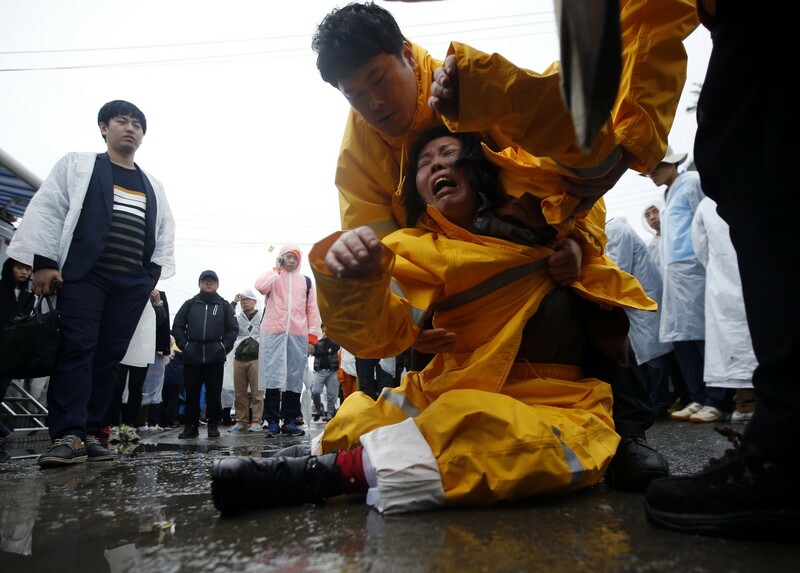 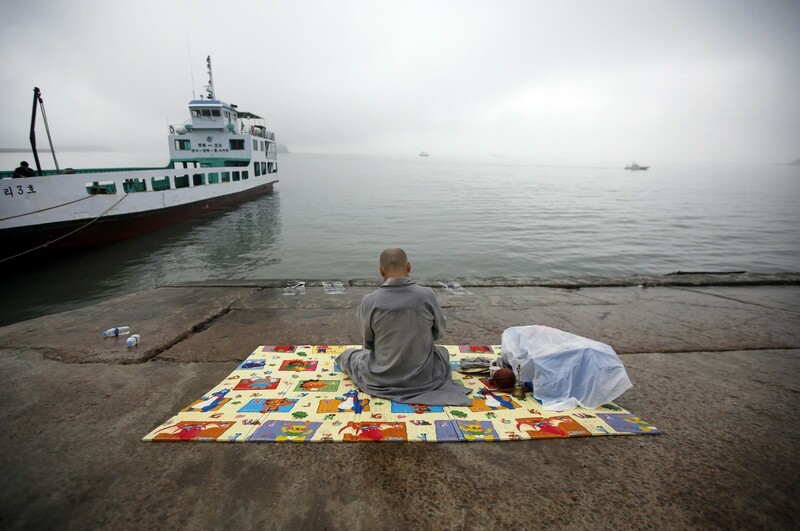 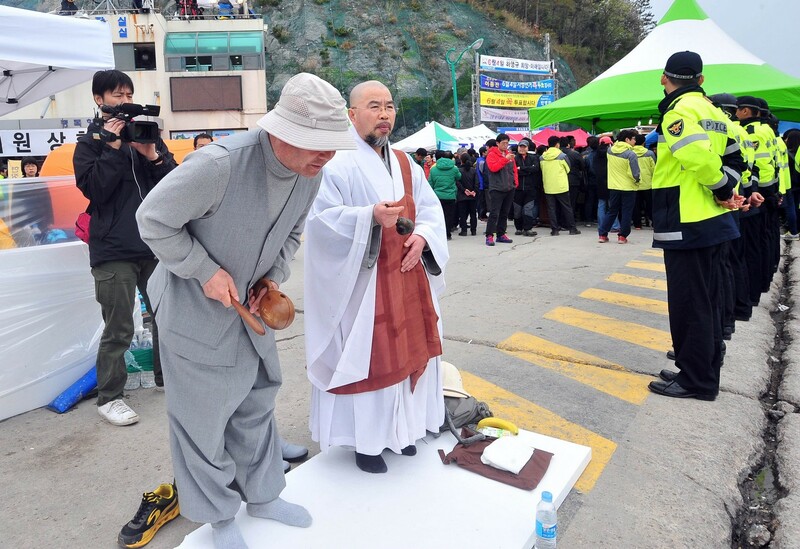 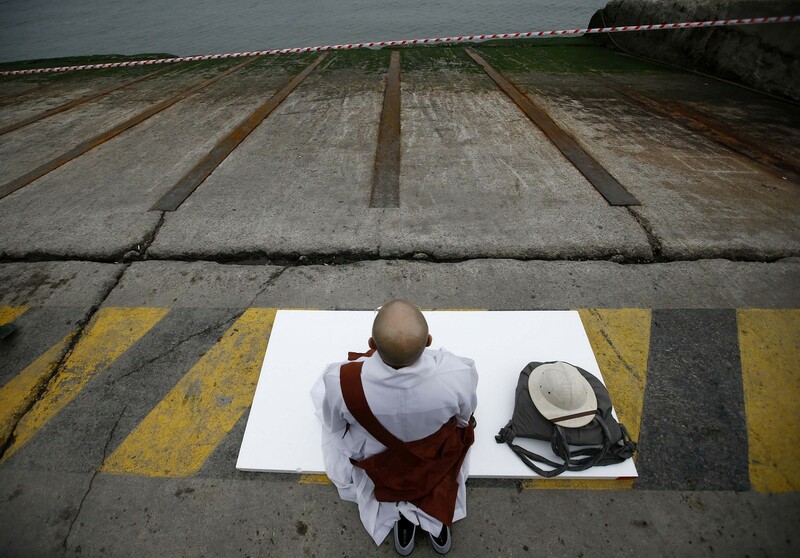 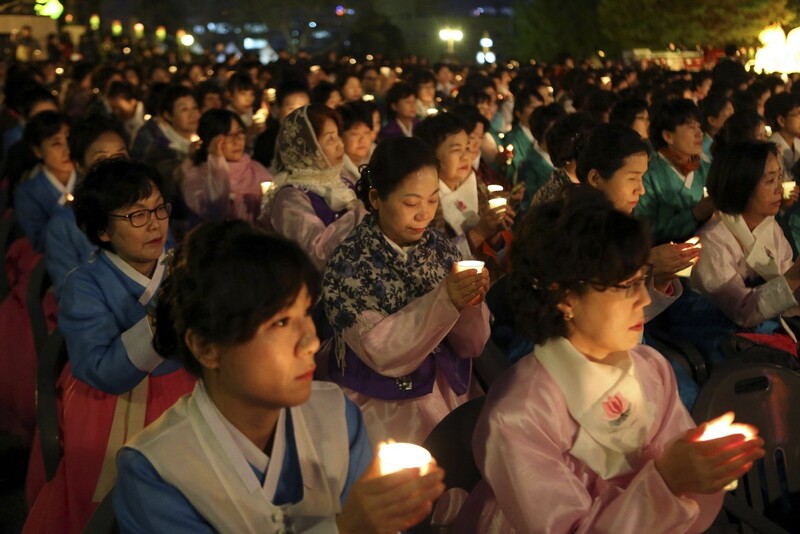 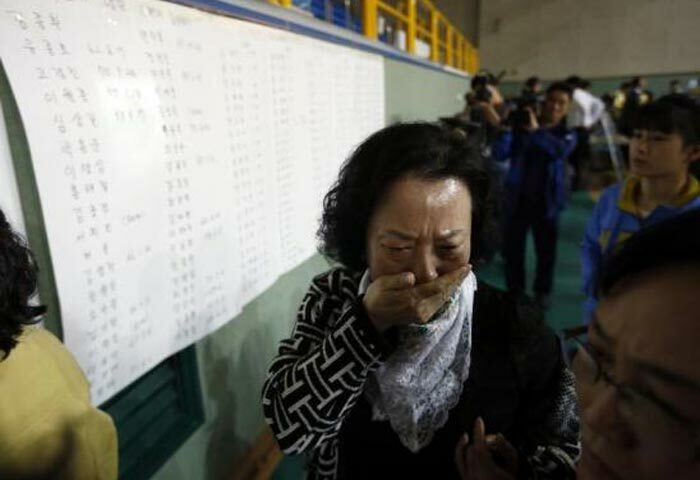 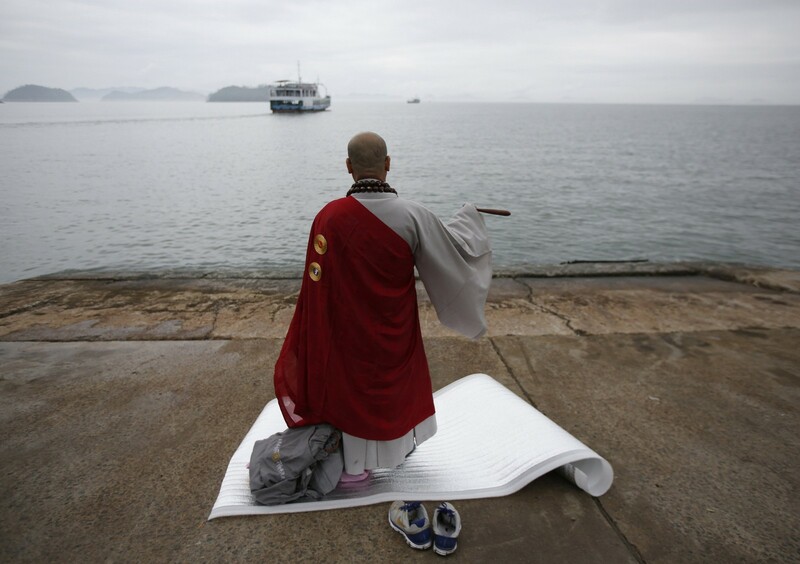 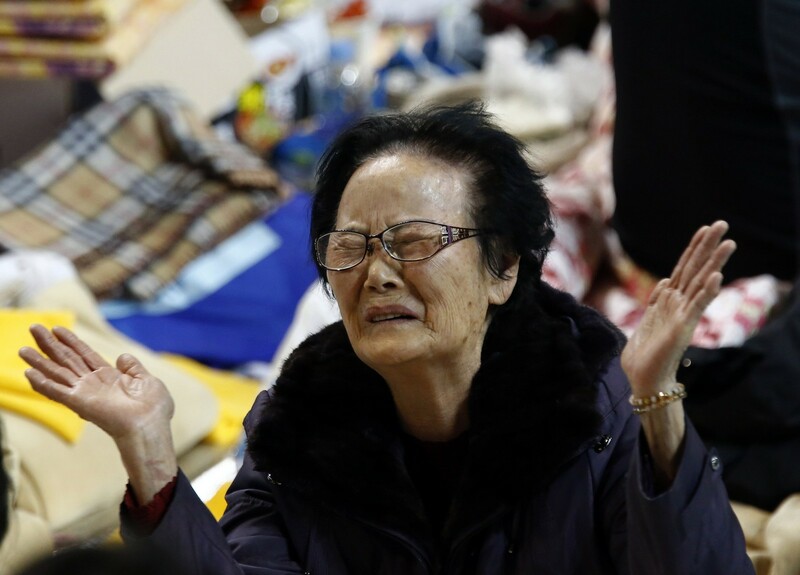 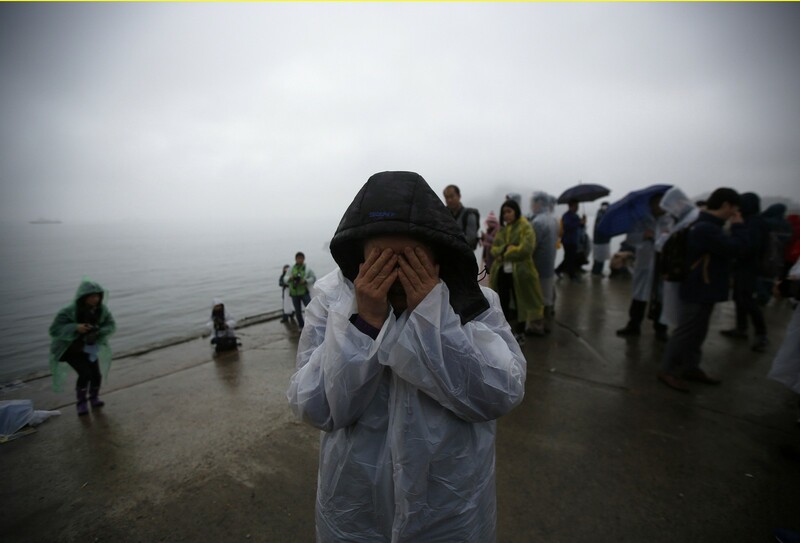 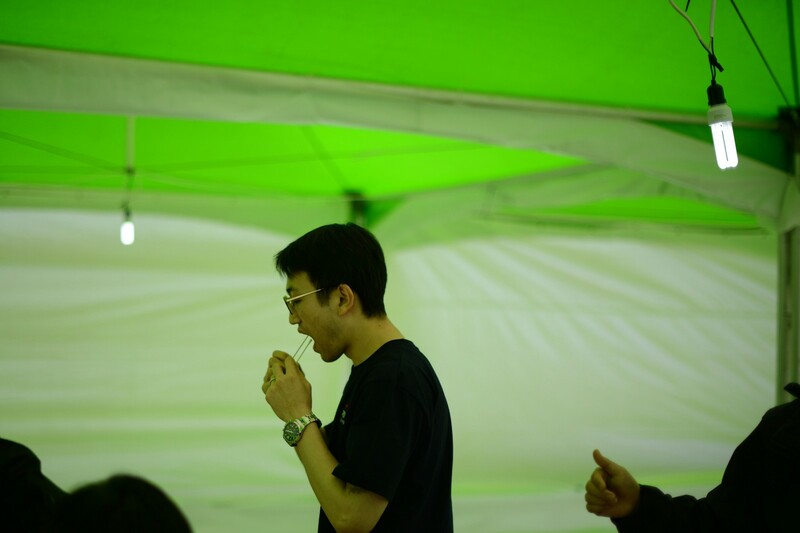 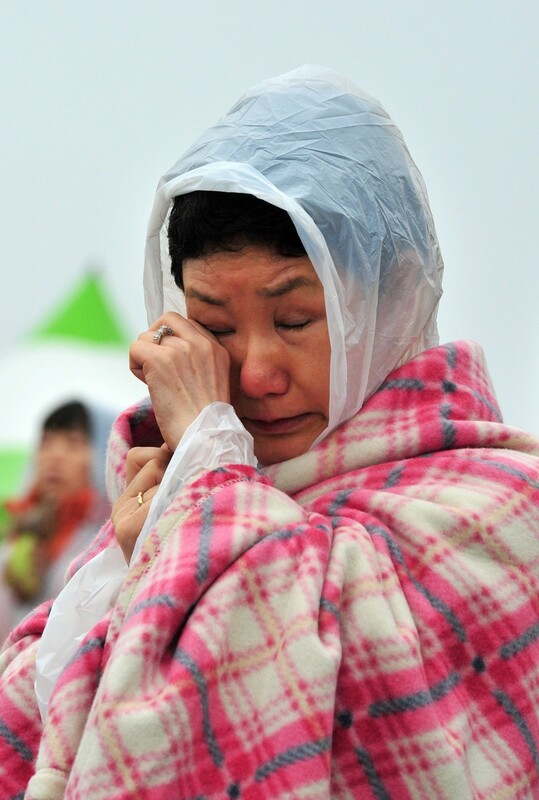 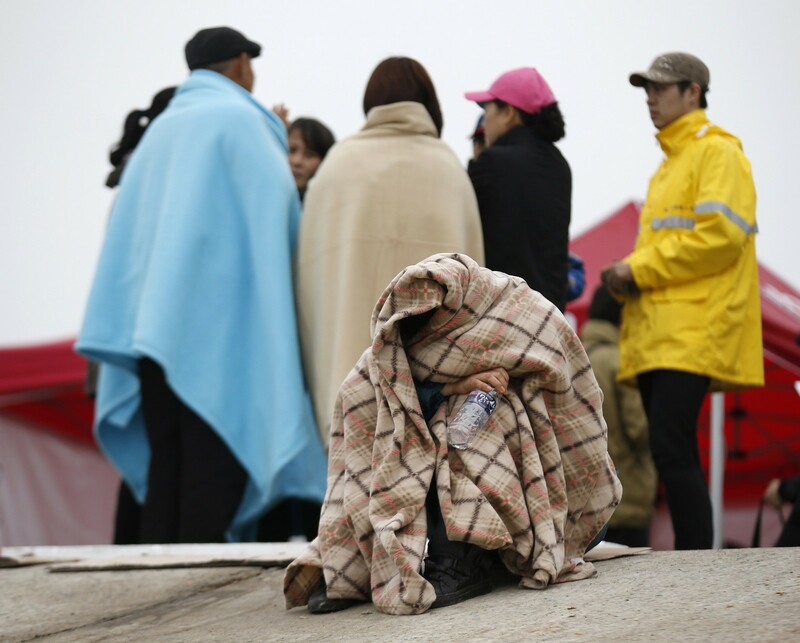 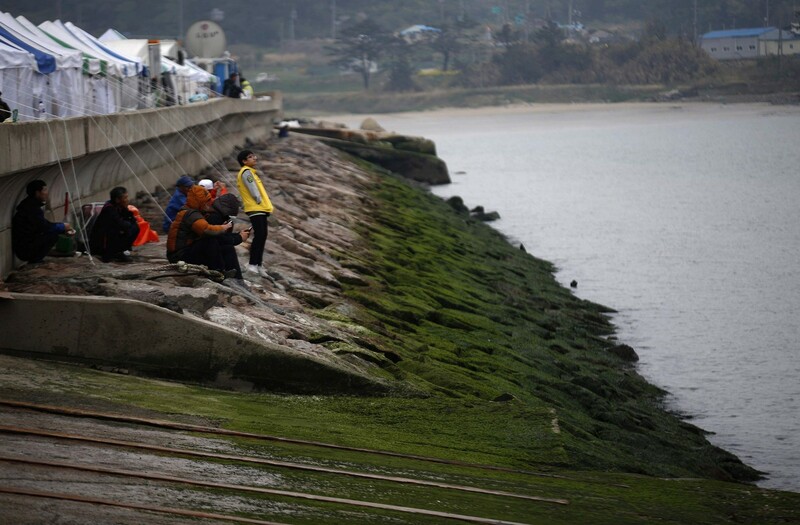 A Buddhist monk prays for the missing passengers who were on the South Korean ferry "Sewol", which sank in the sea off Jindo, at a port where family members of the missing have gathered, in Jindo April 18, 2014. 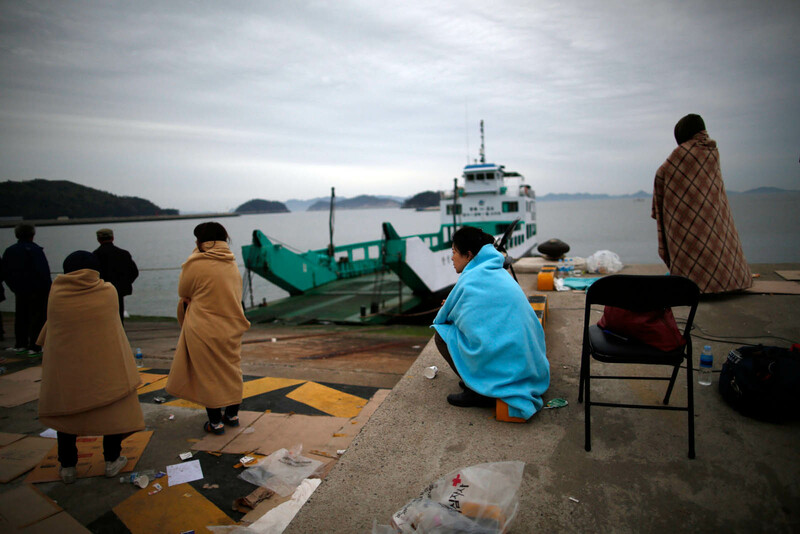 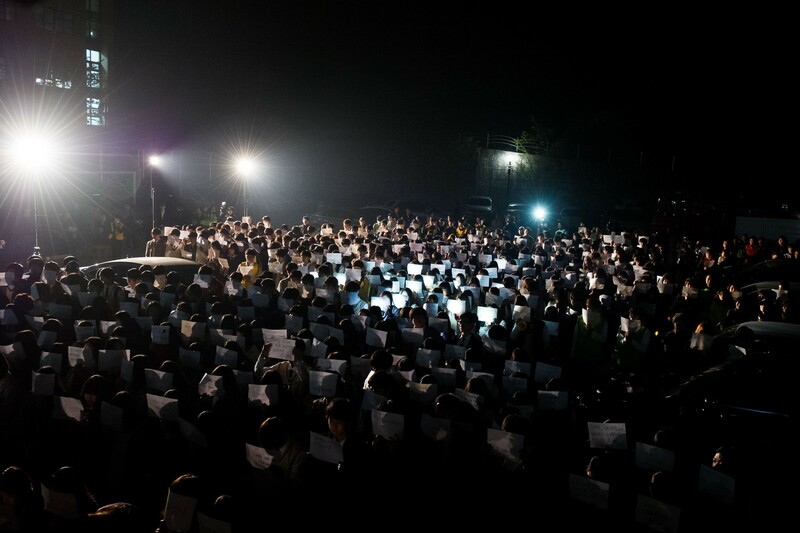 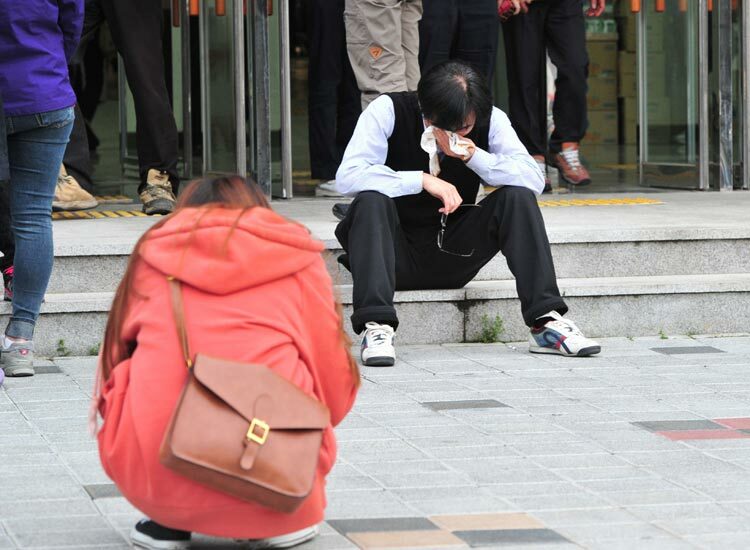 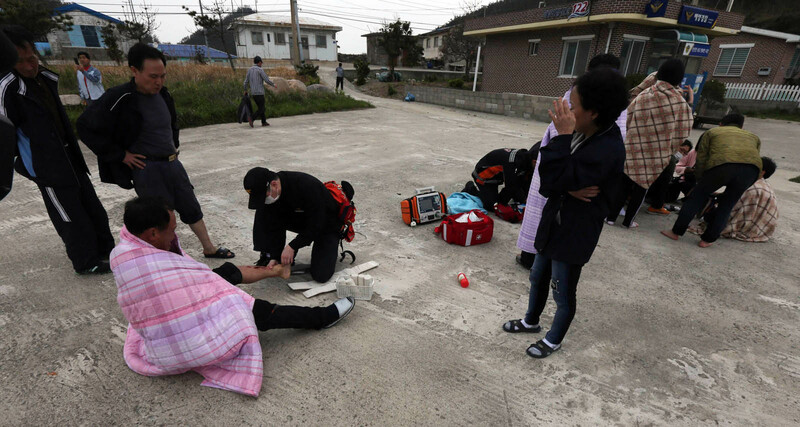 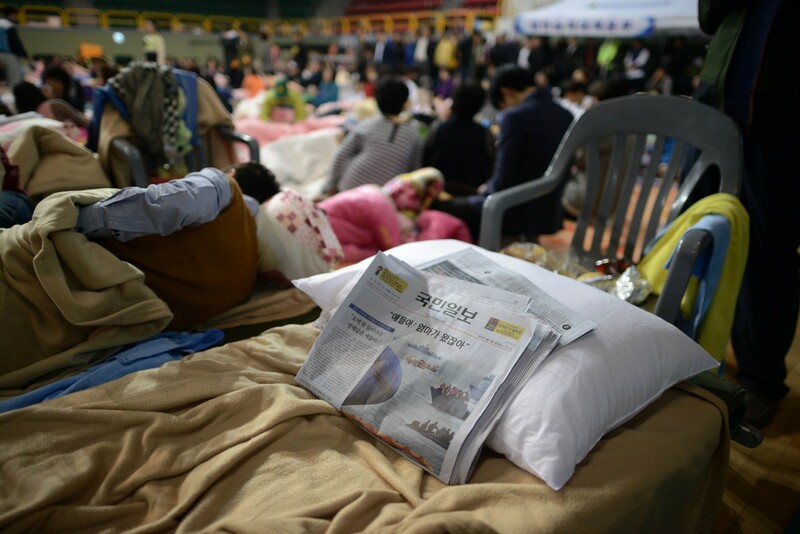 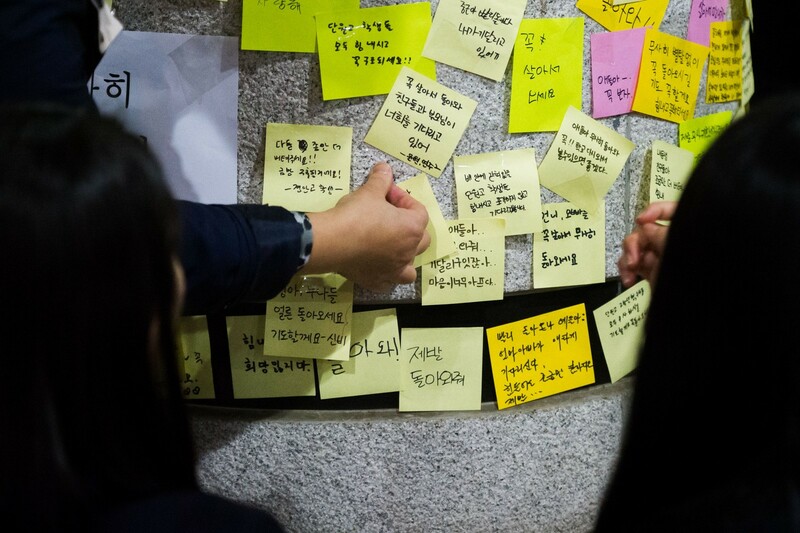 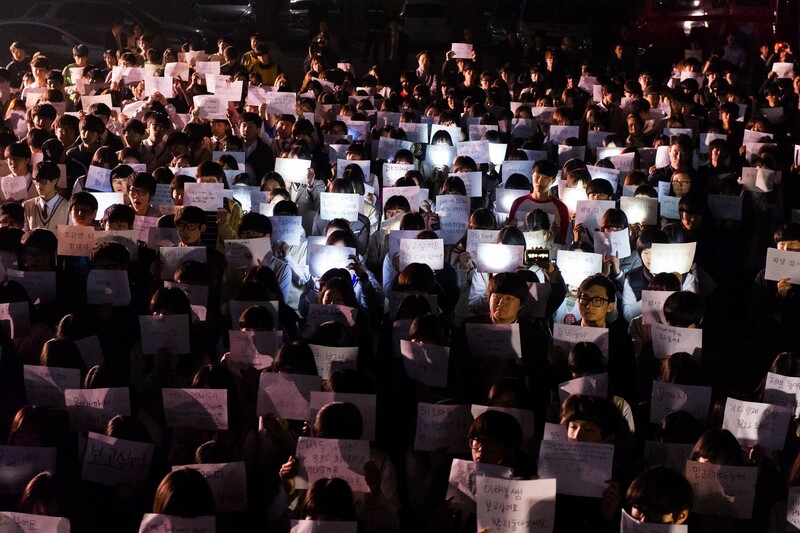 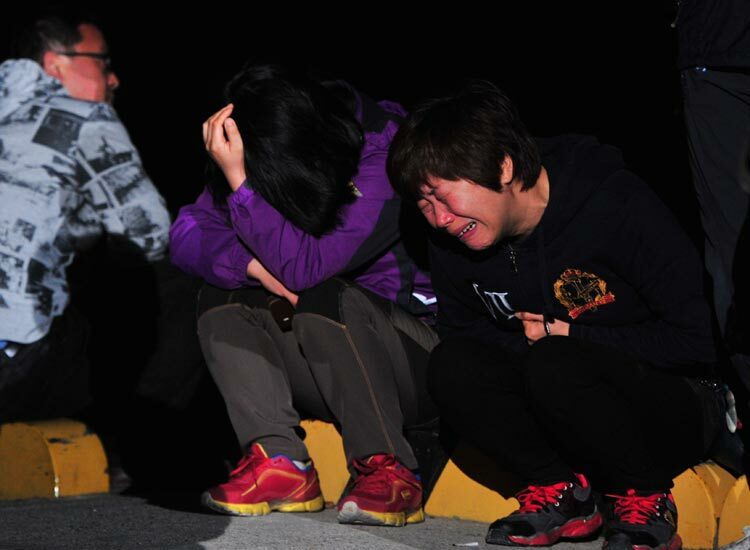 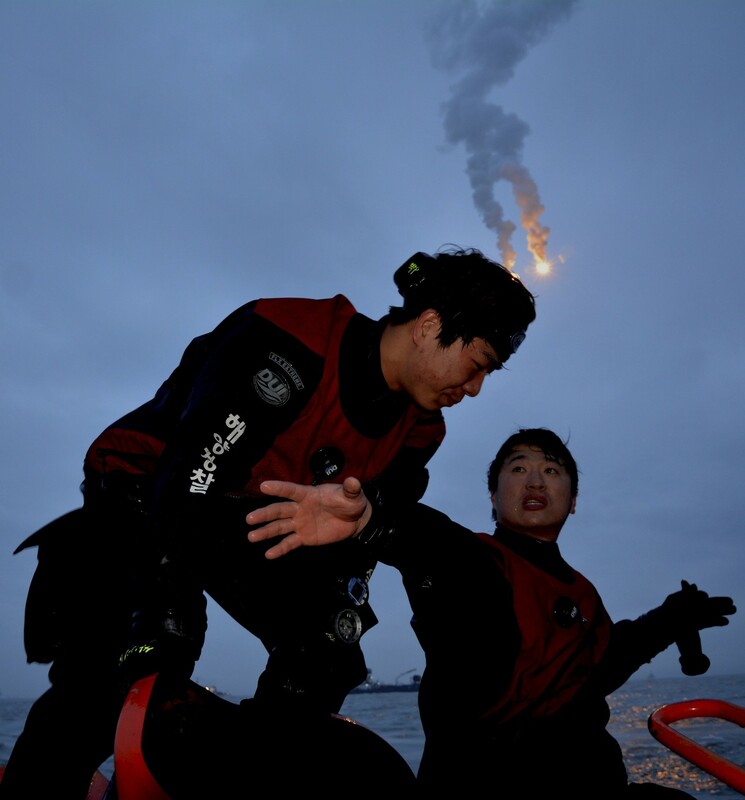 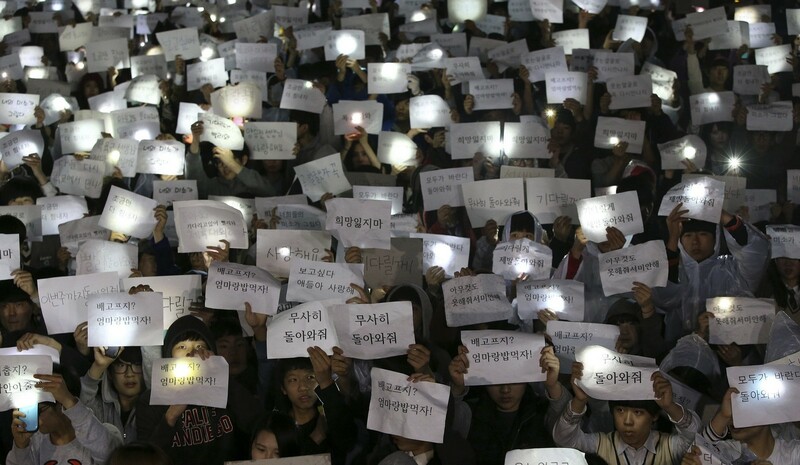 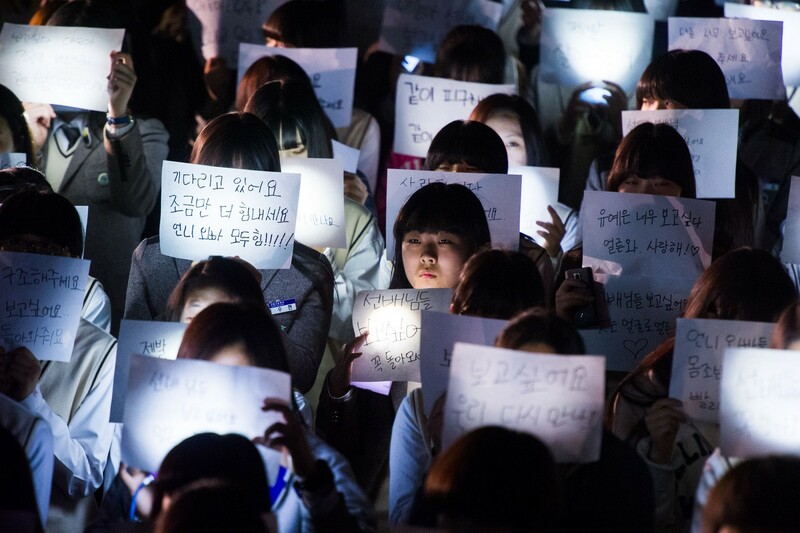 JINDO, South Jeolla Province - Night and day merged into each other on Jindo Island off the south-western coast of the Korean Peninsula, as families of those still missing after Wednesday morning's ferry sinking now wait for a miracle. 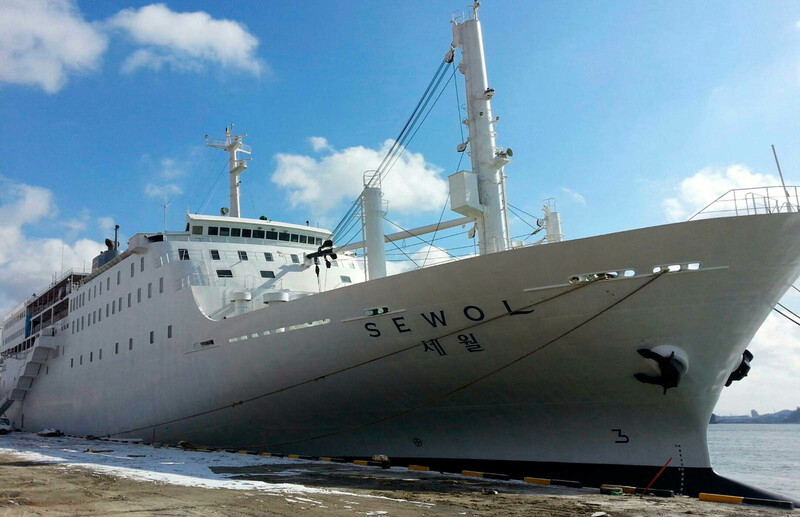 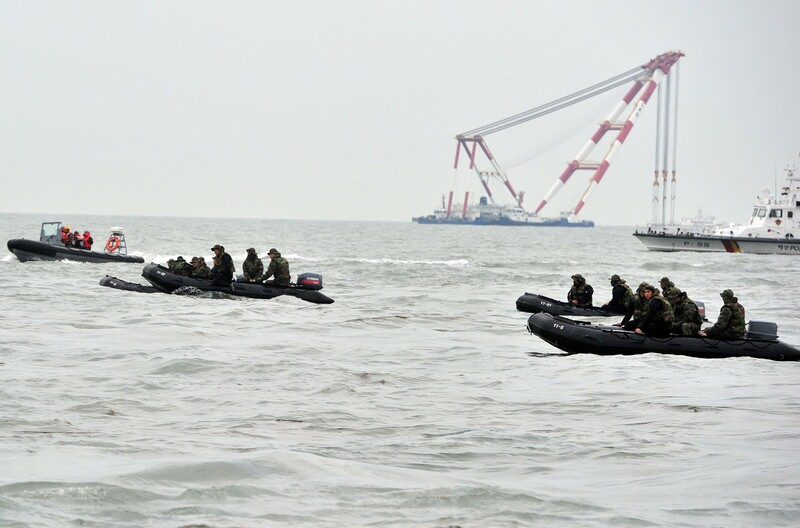 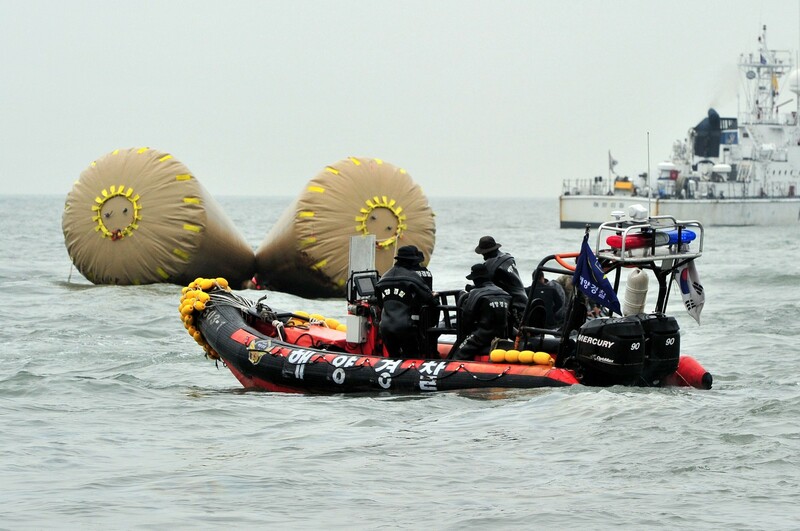 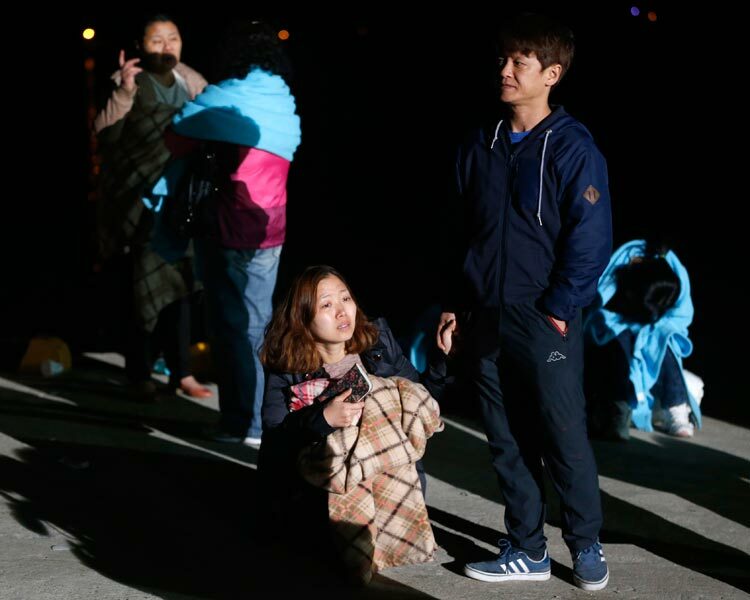 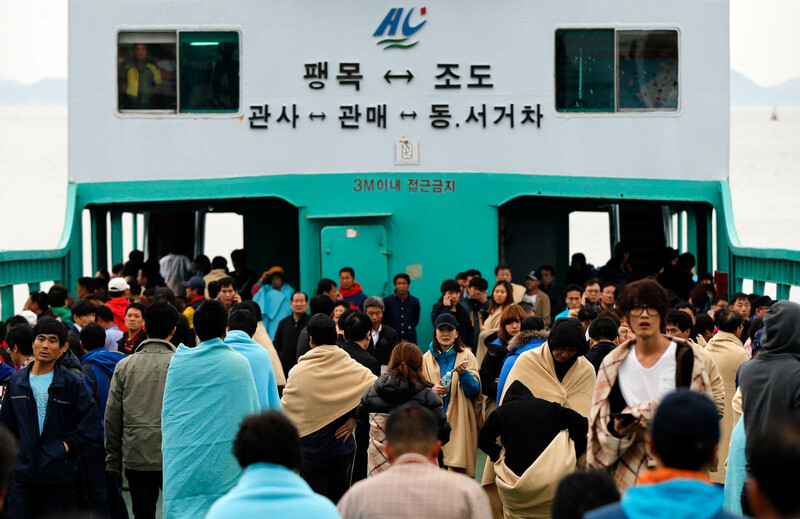 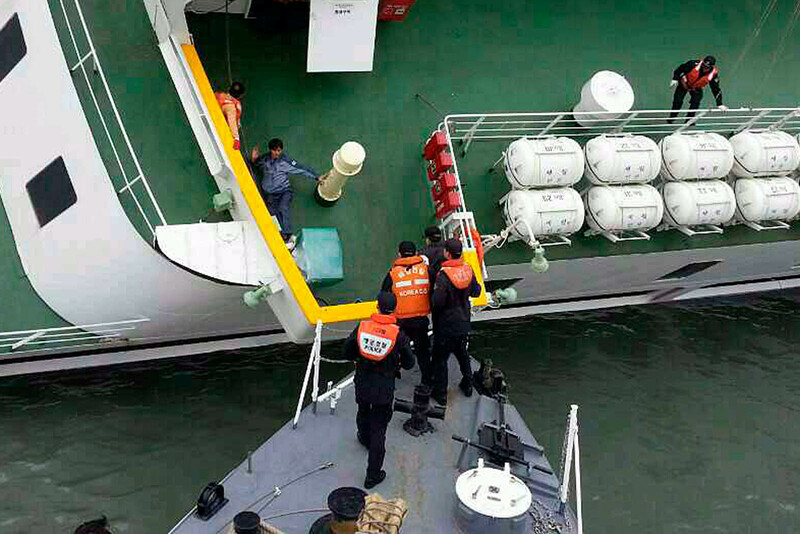 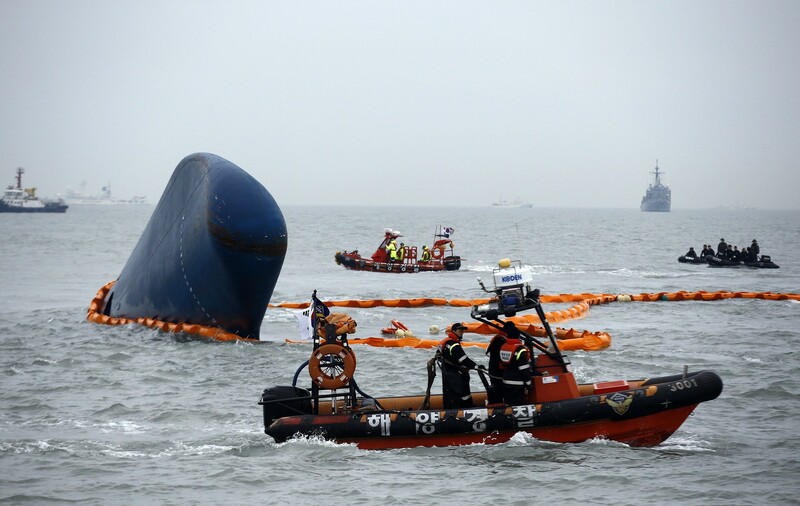 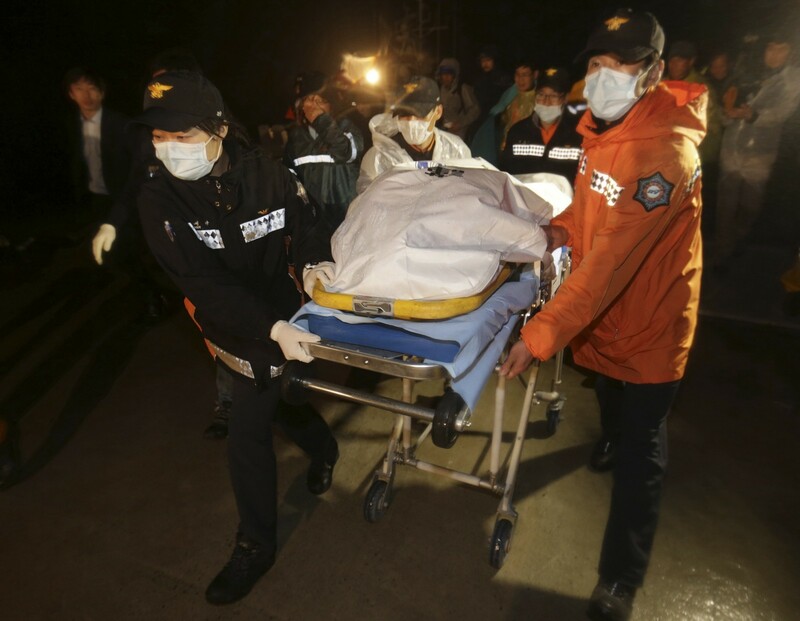 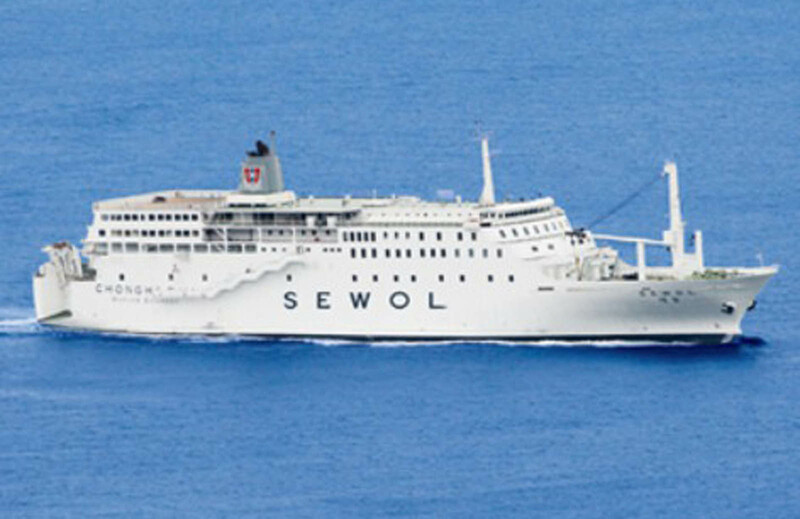 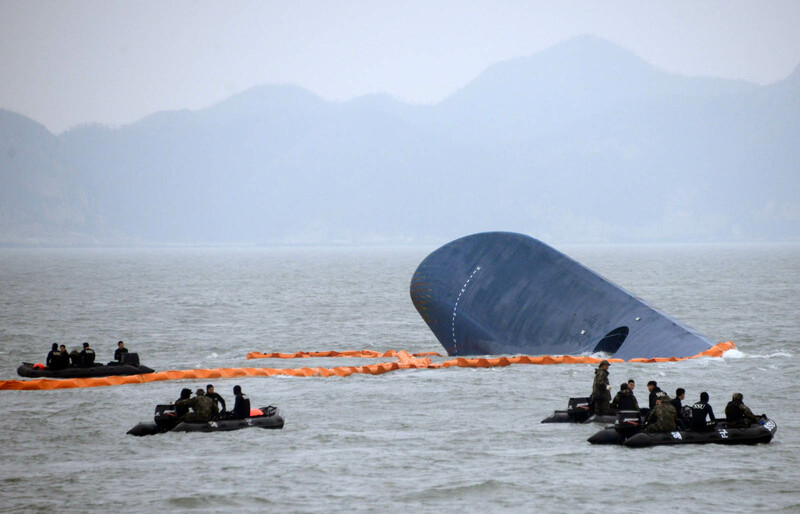 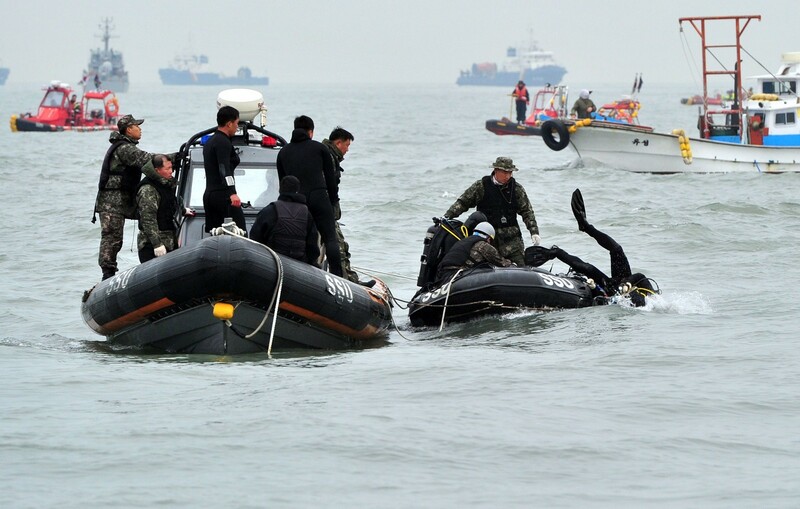 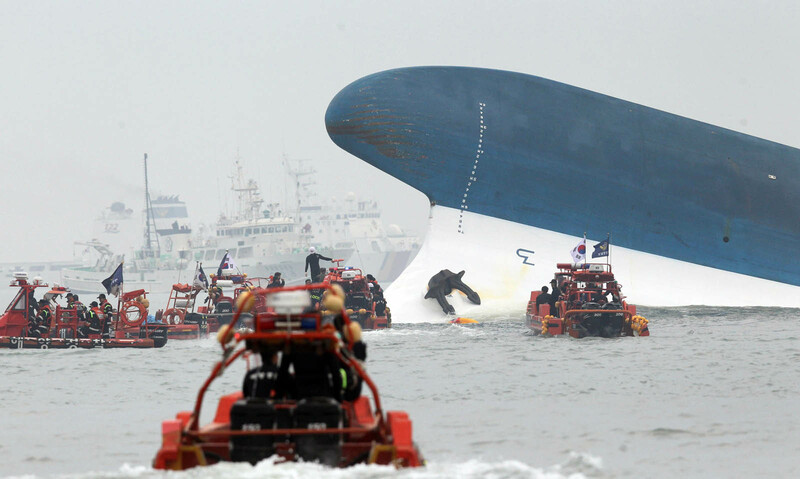 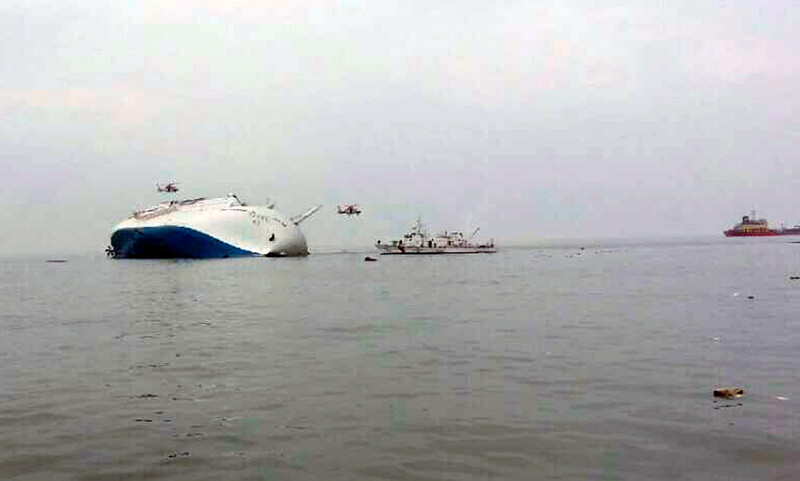 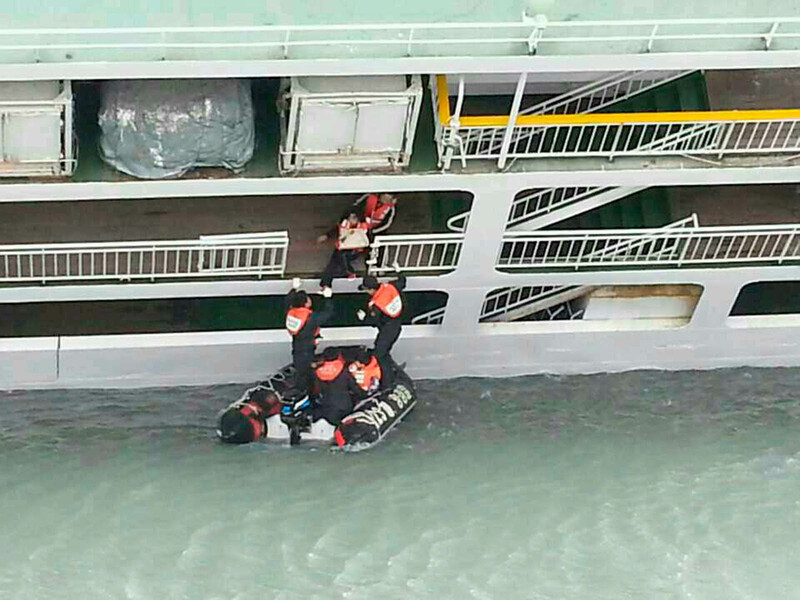 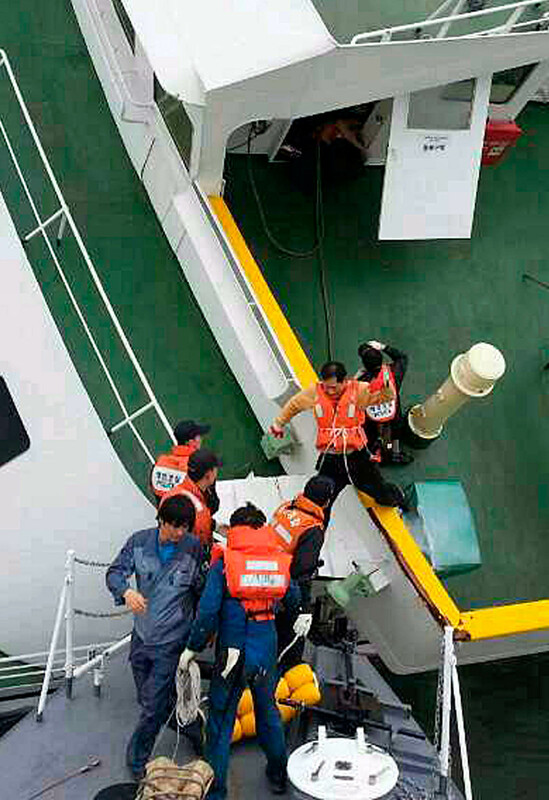 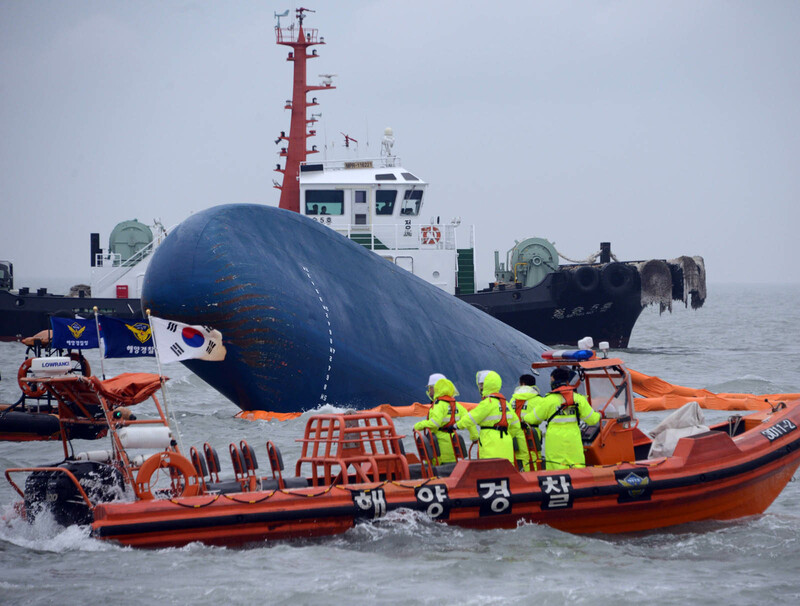 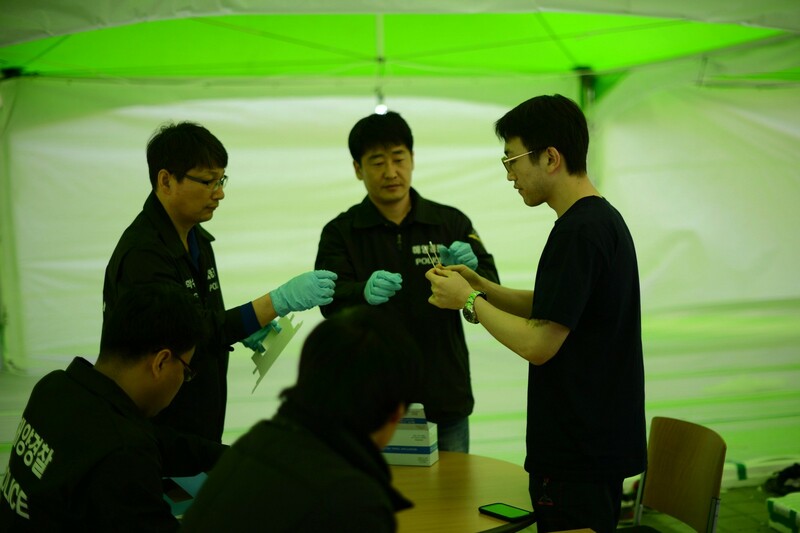 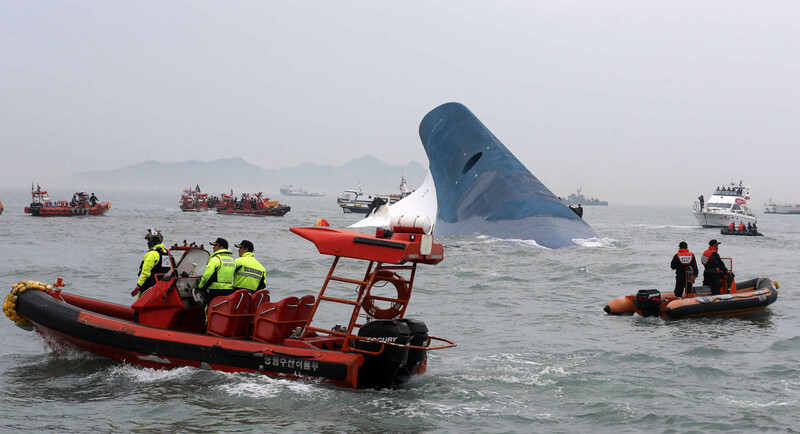 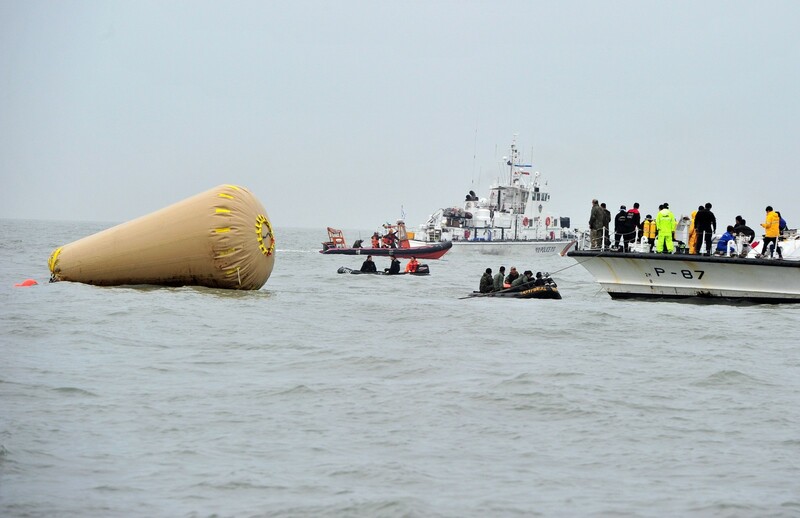 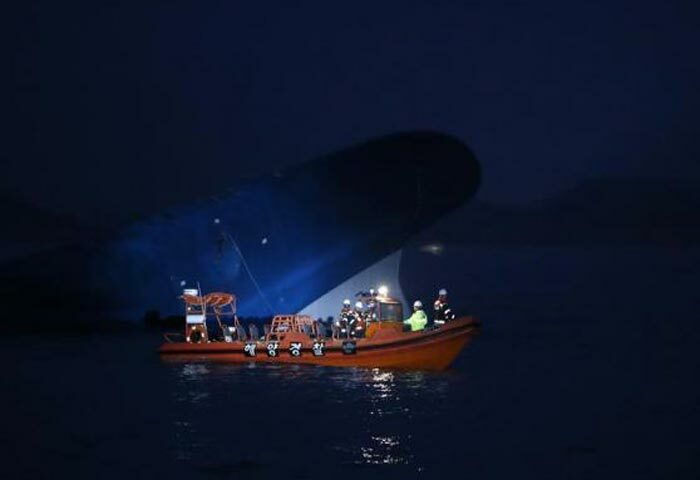 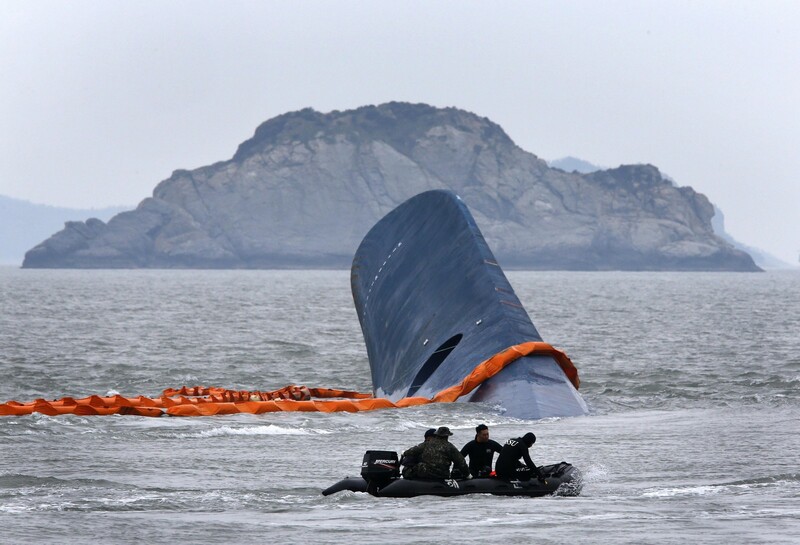 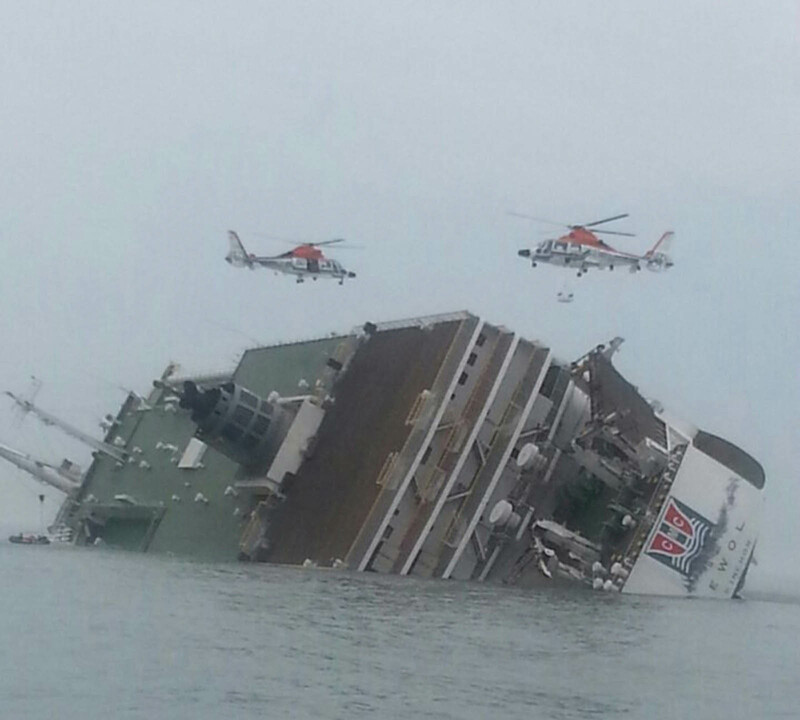 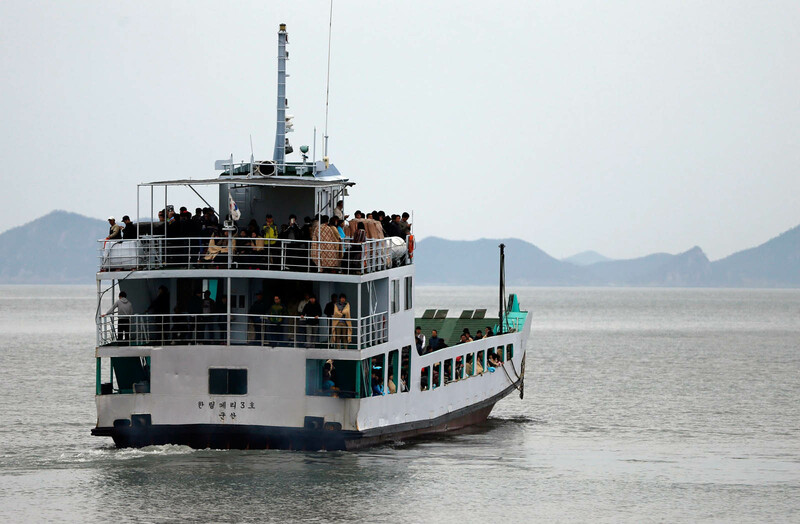 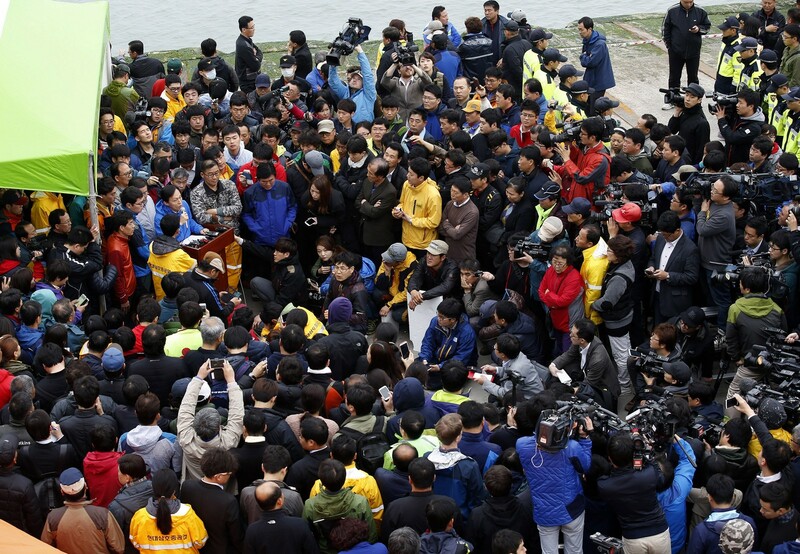 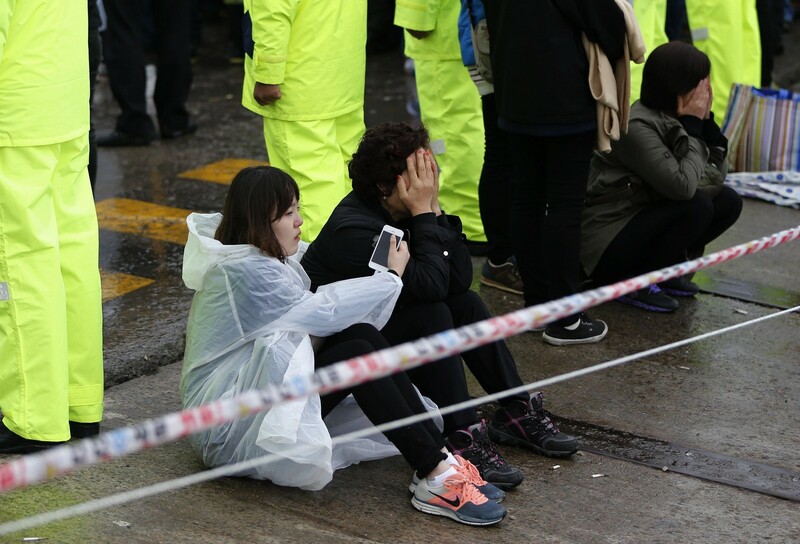 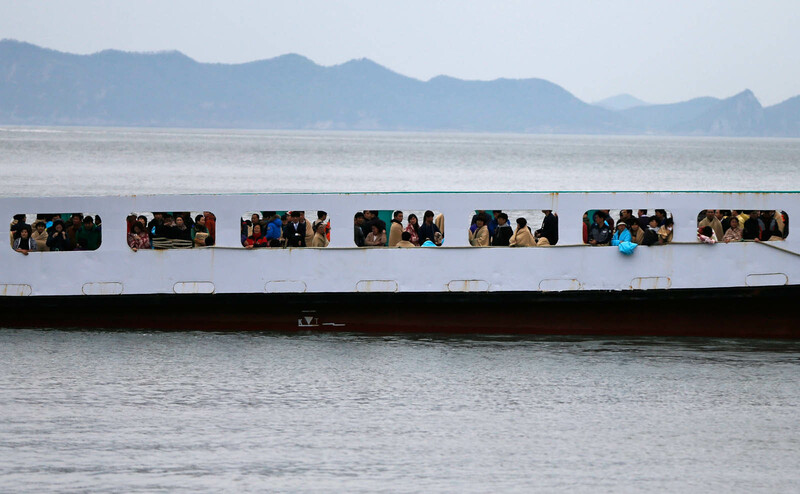 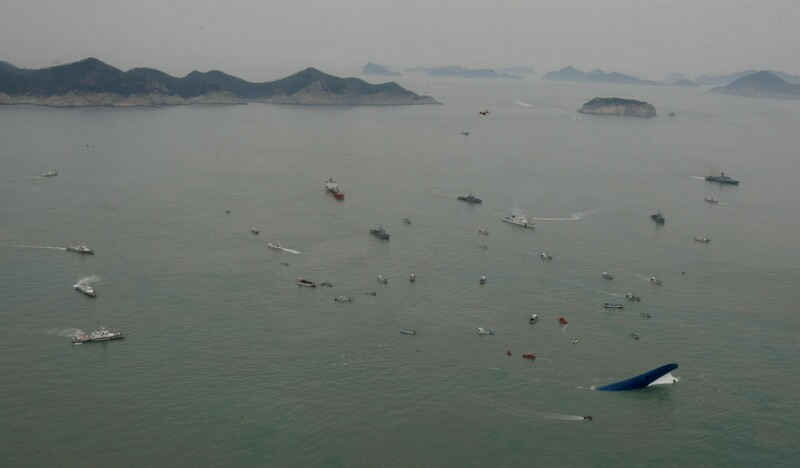 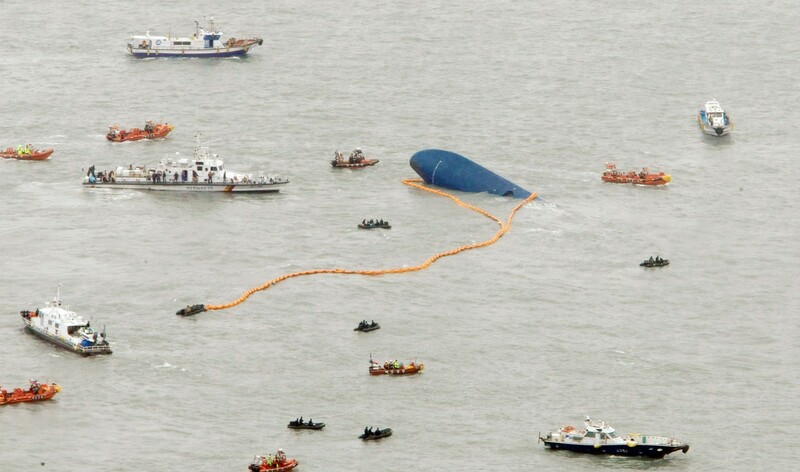 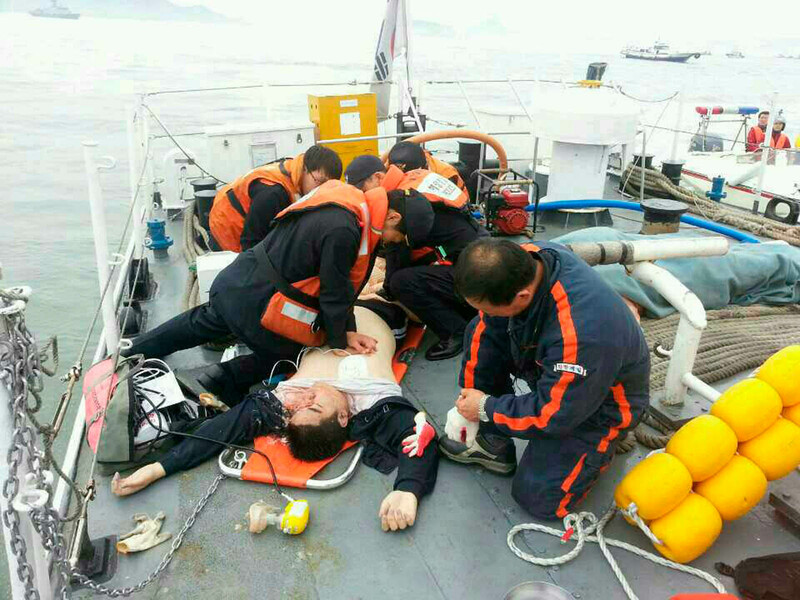 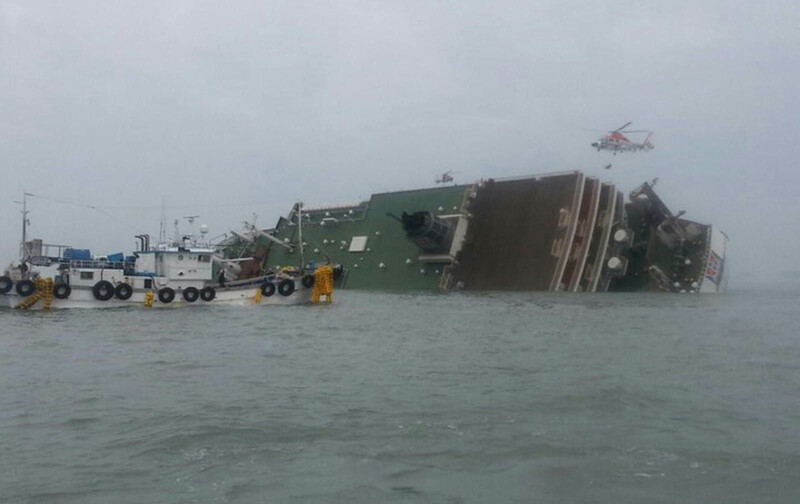 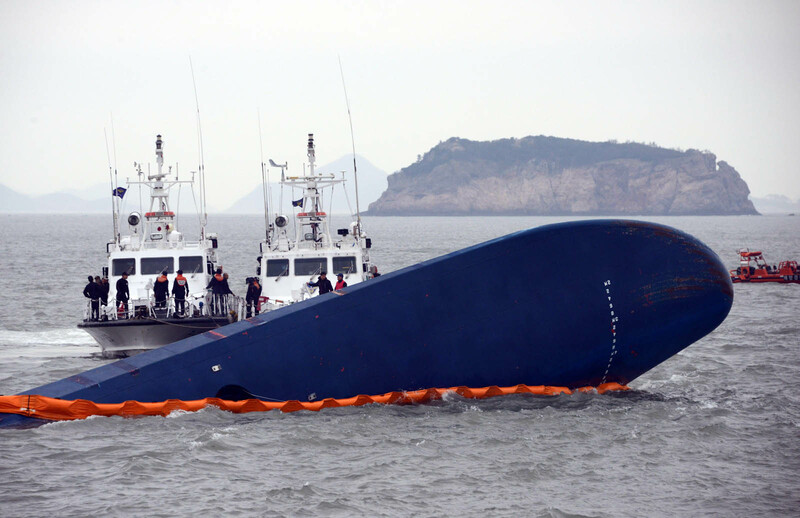 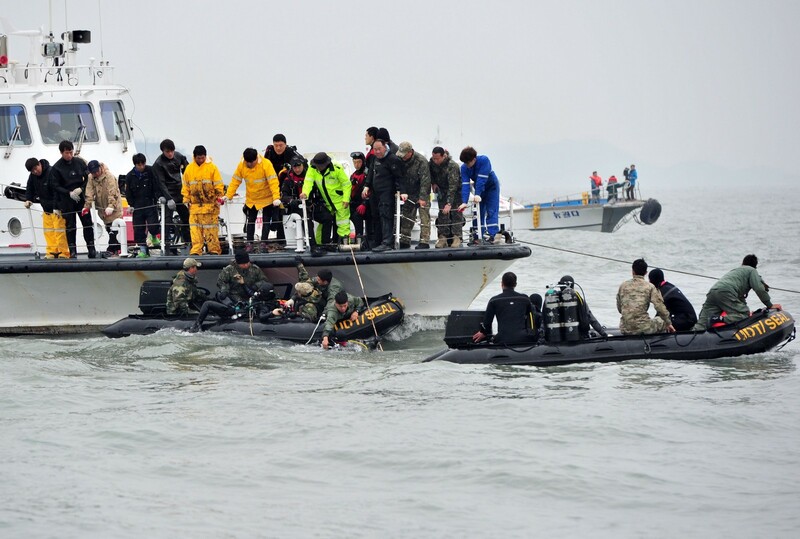 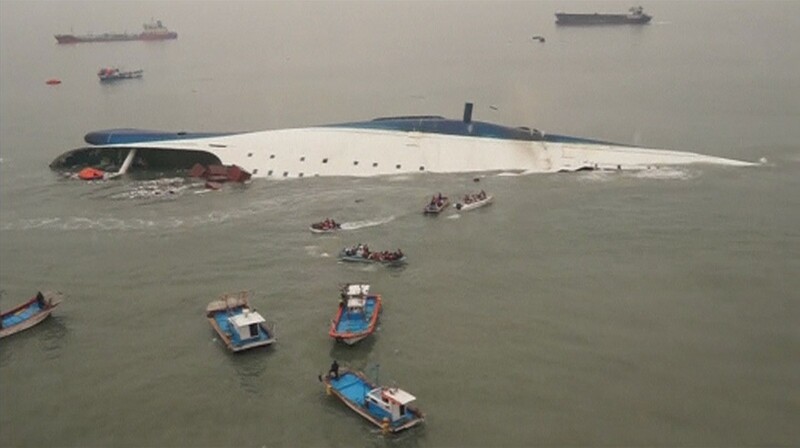 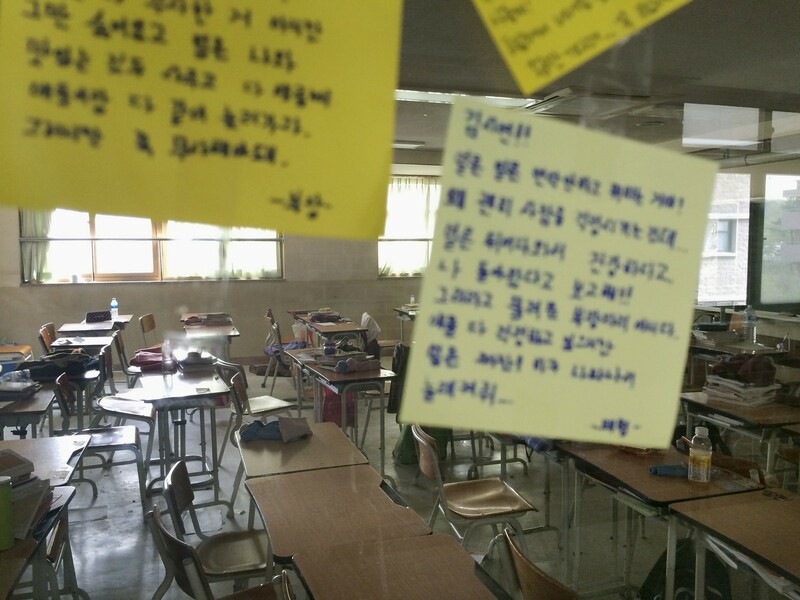 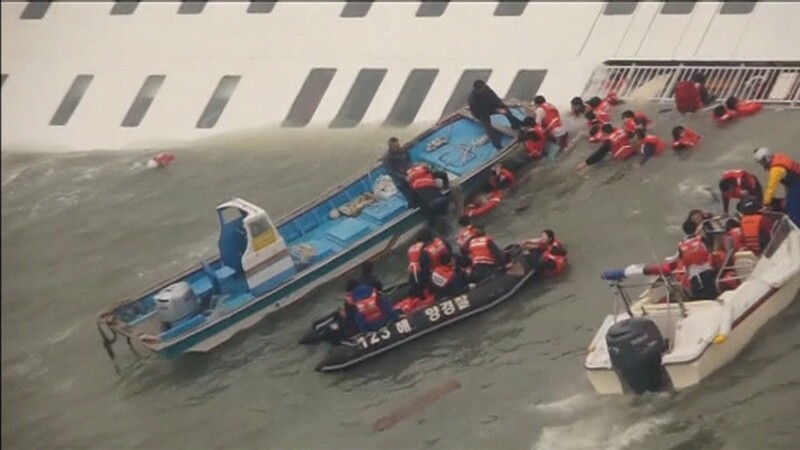 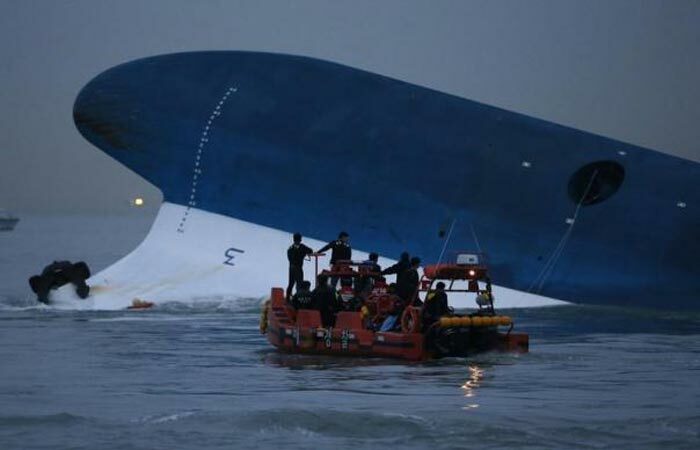 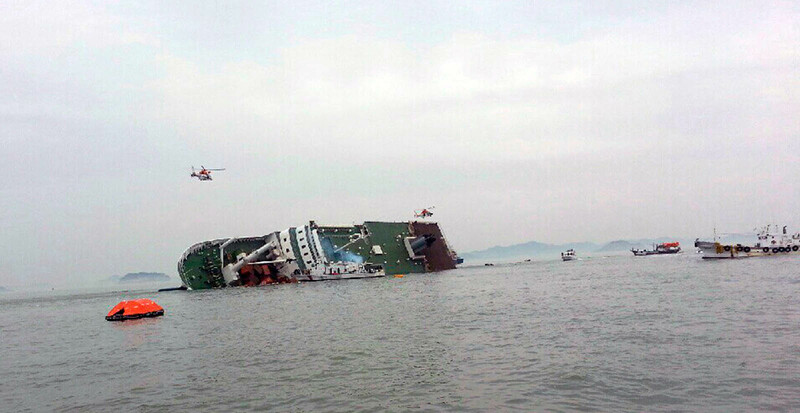 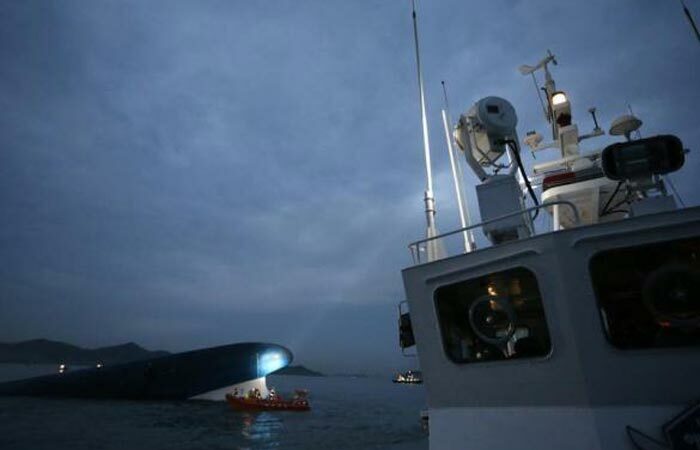 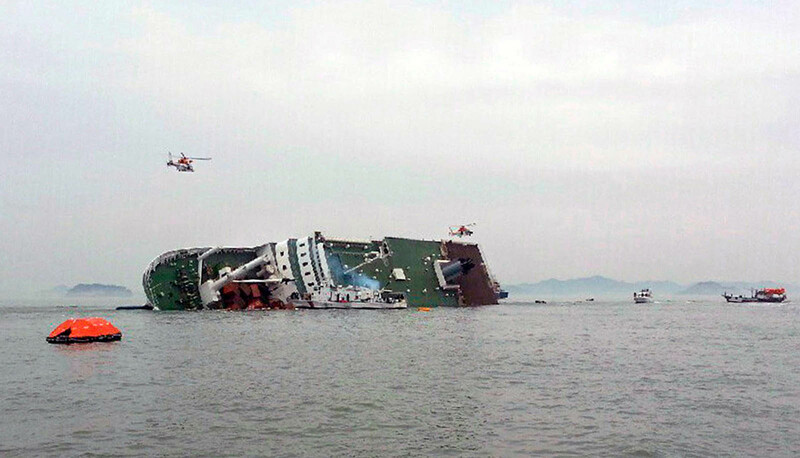 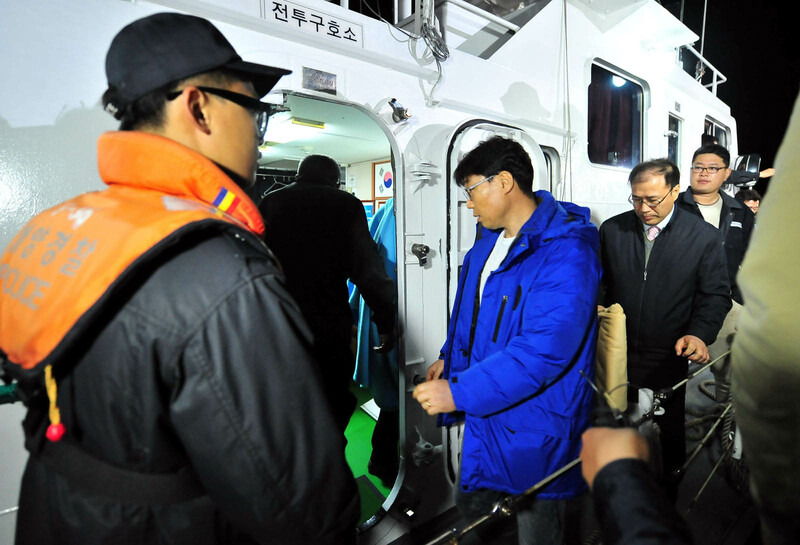 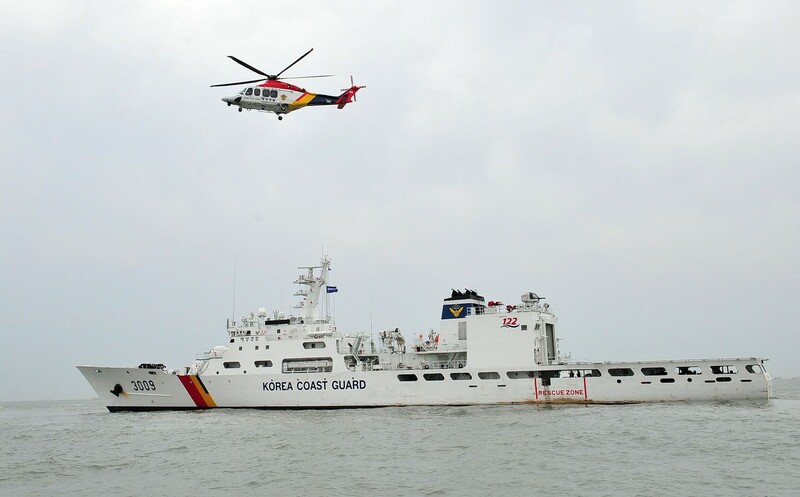 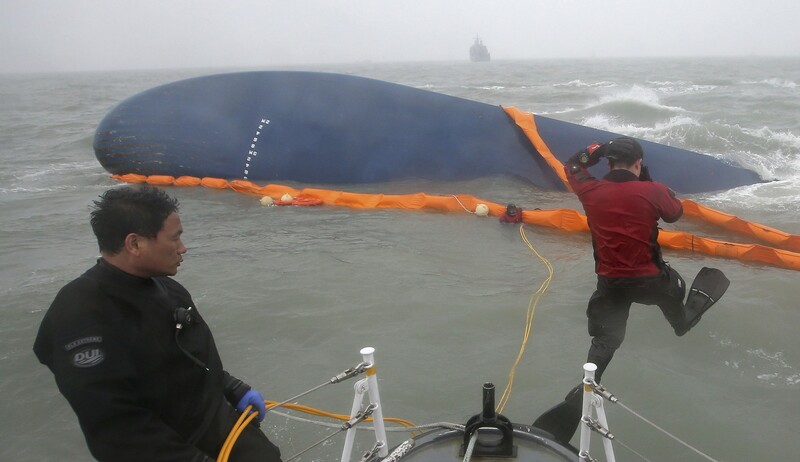 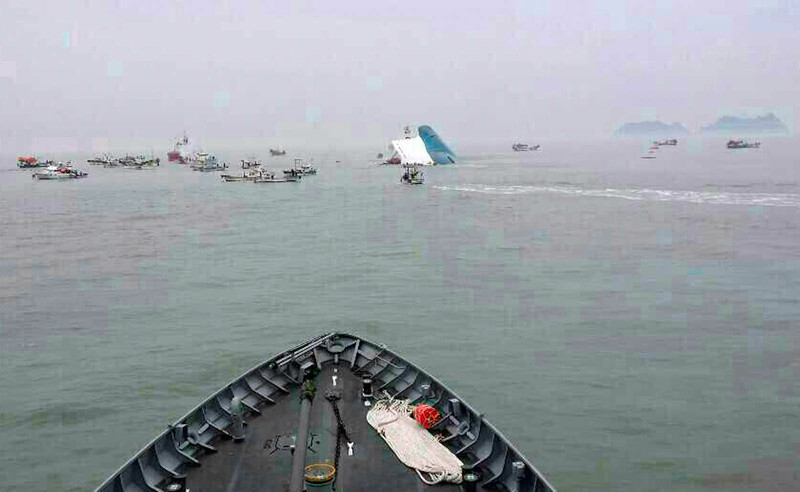 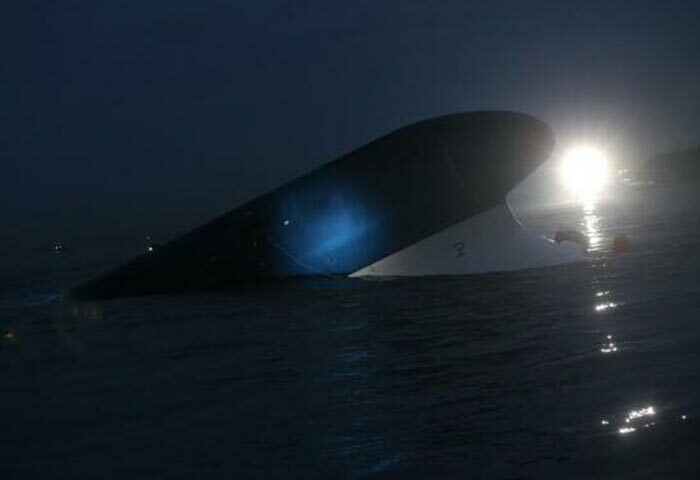 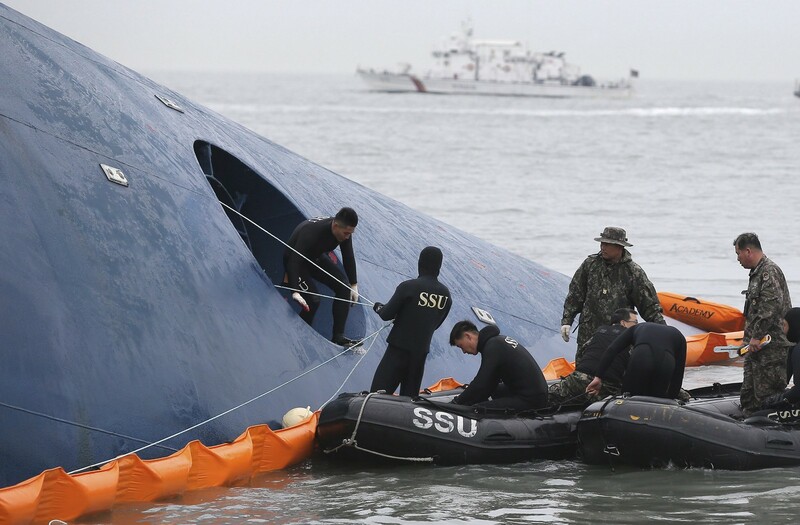 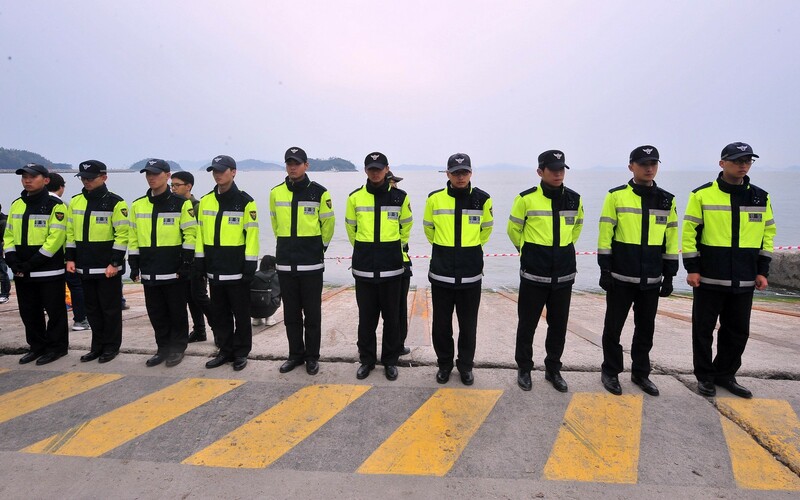 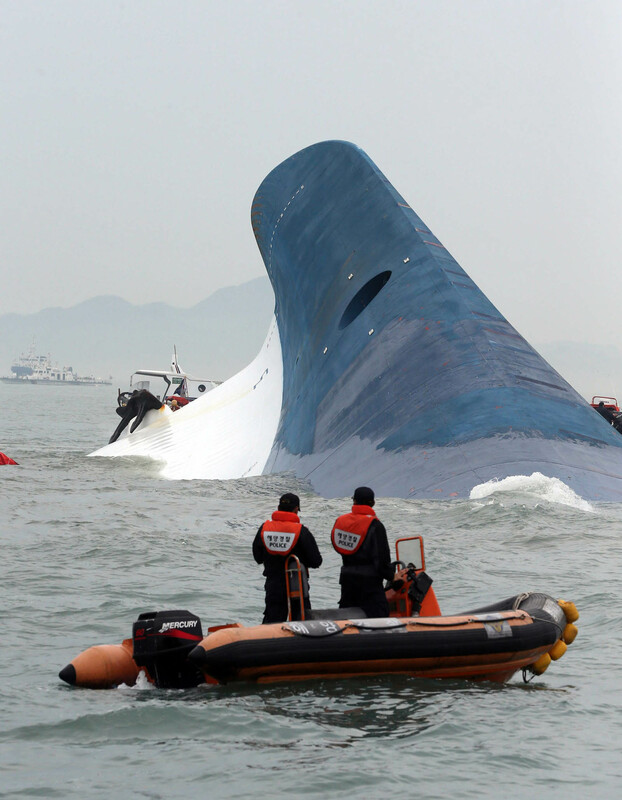 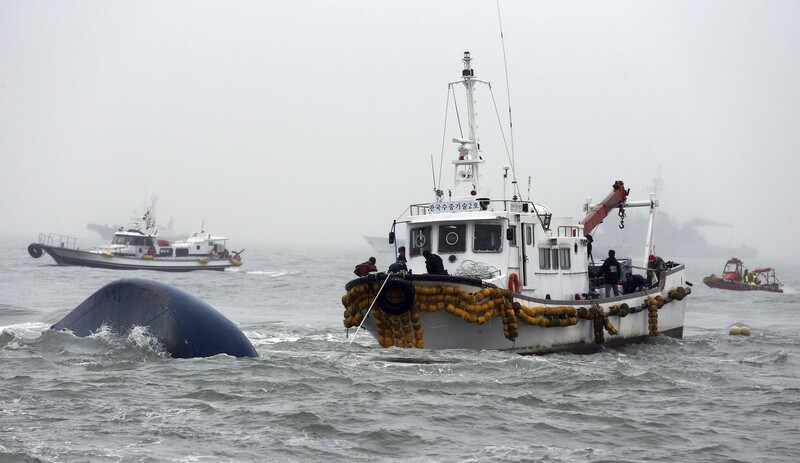 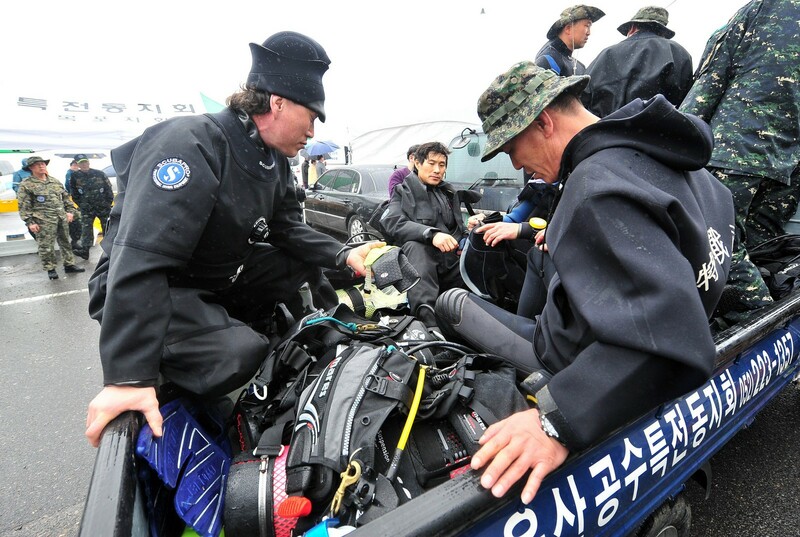 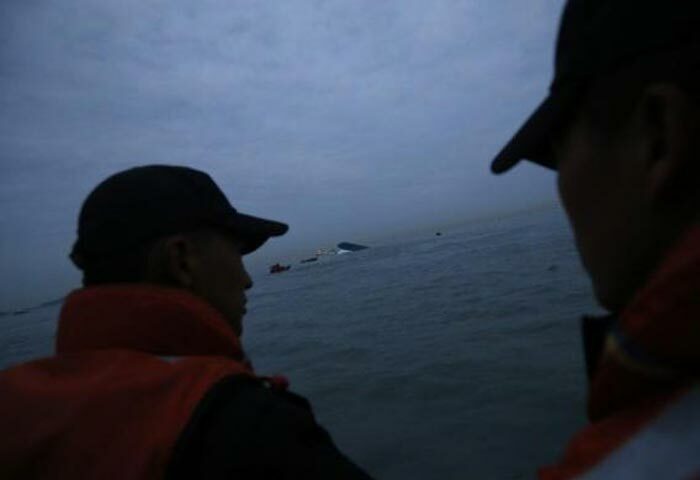 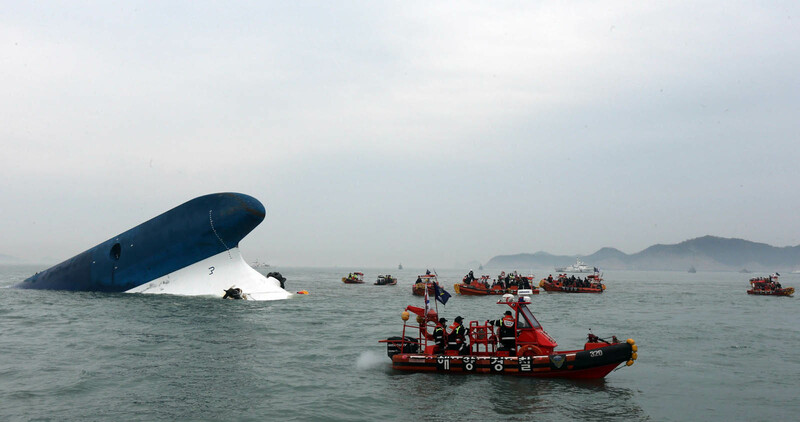 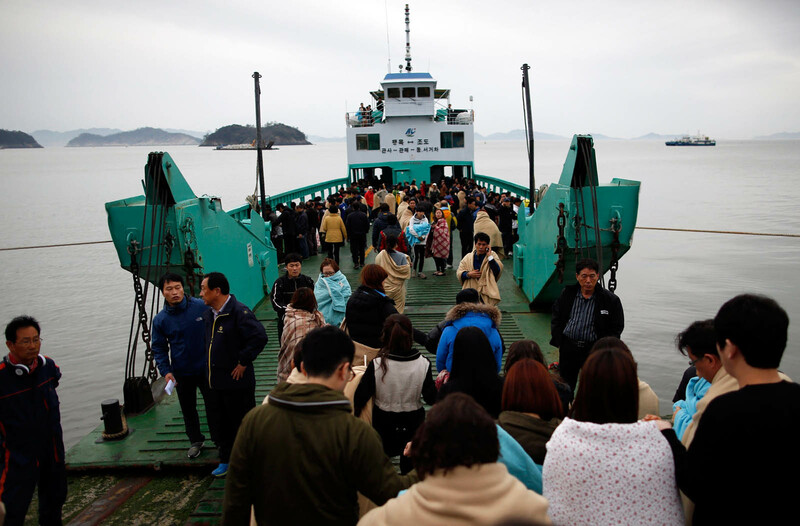 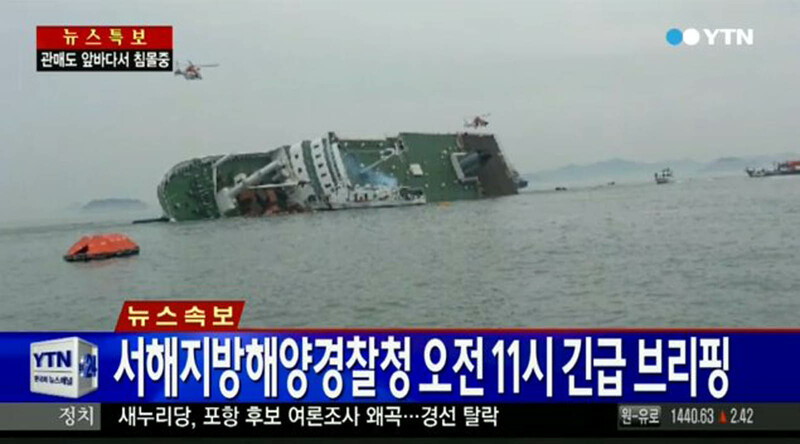 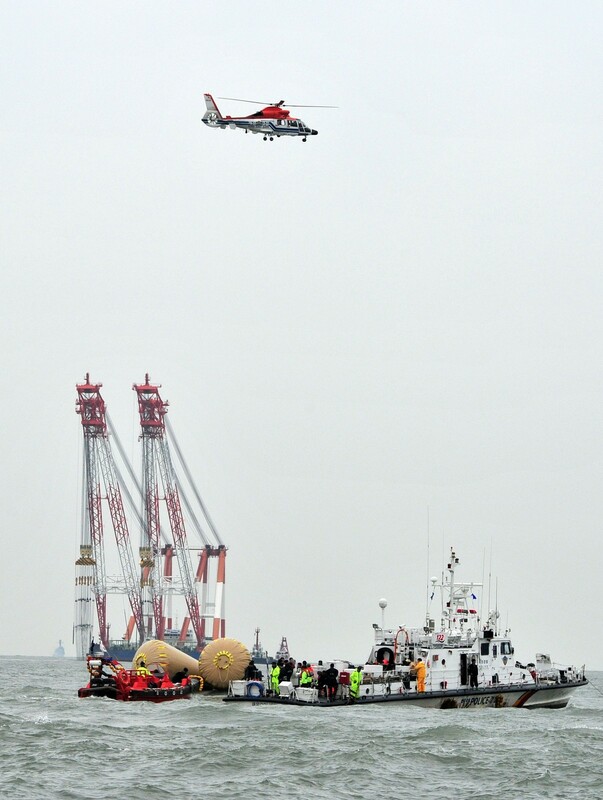 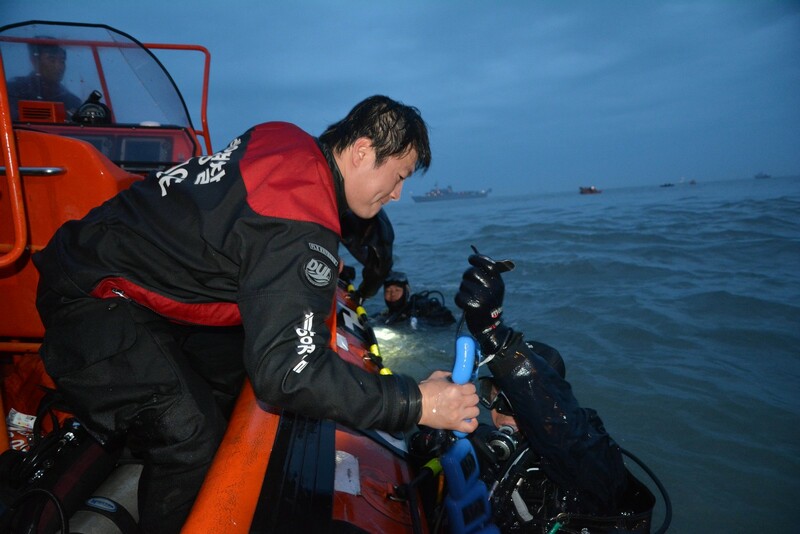 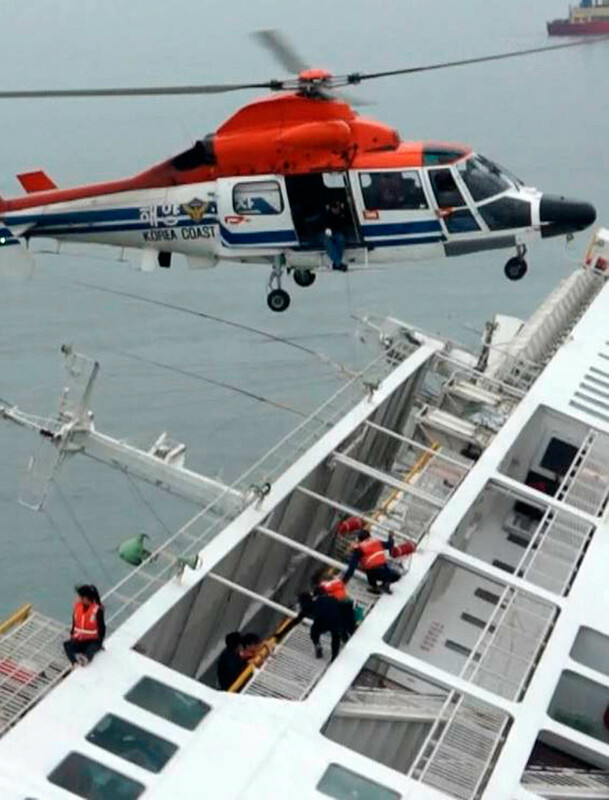 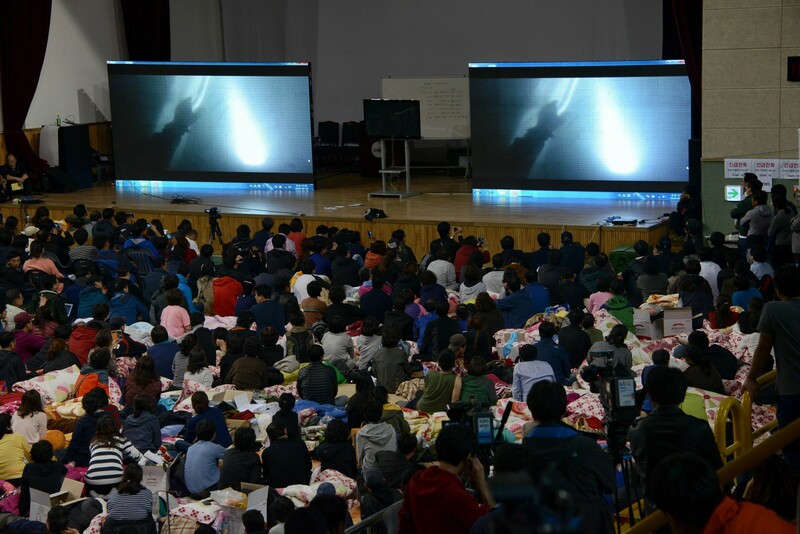 The ferry, which left Incheon on Tuesday night with 475 passengers aboard - including 325 Danwon High School students from Ansan, Gyeonggi Province, on their way to a school trip to the southern island of Jeju - sank near Jindo Island on Wednesday morning. 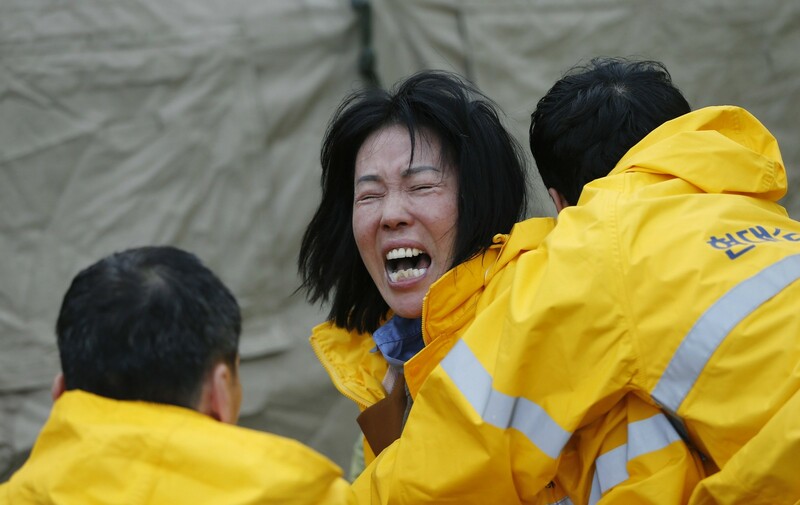 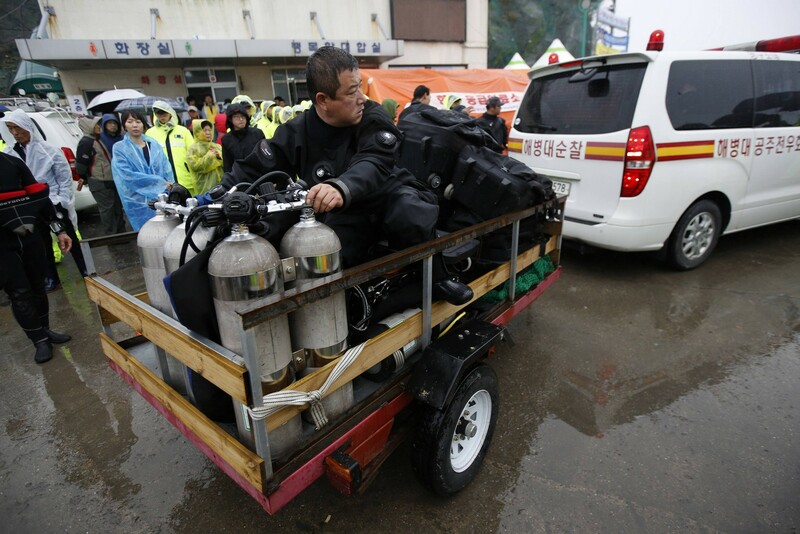 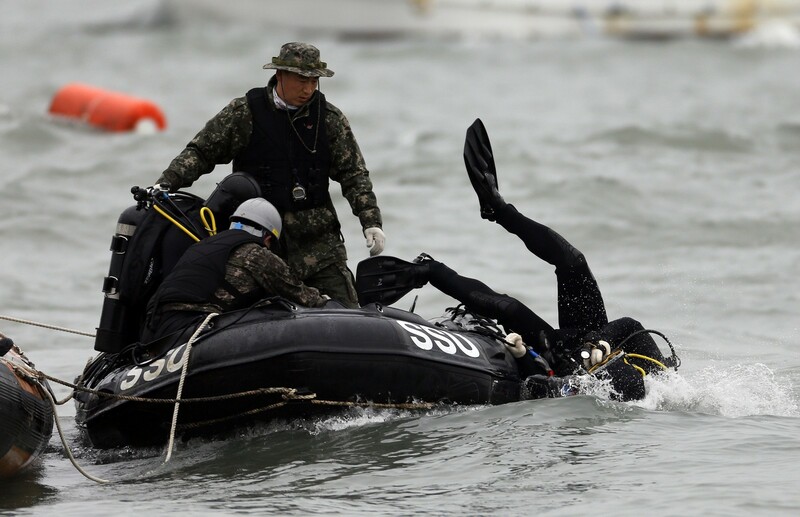 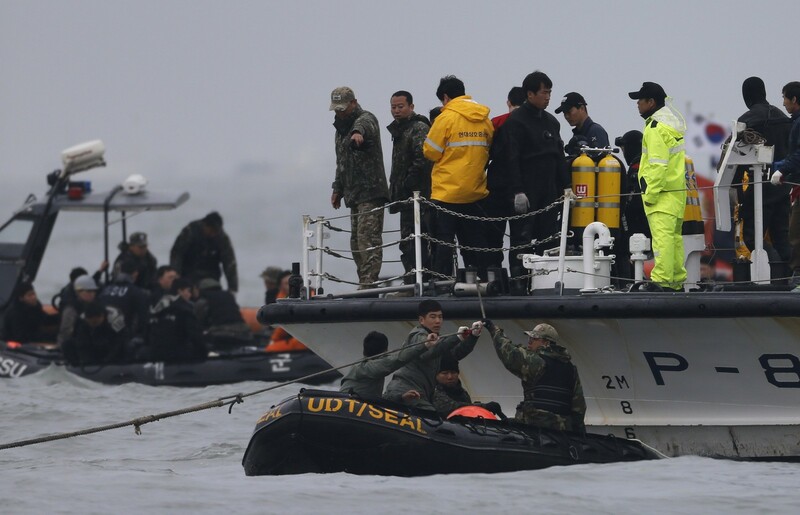 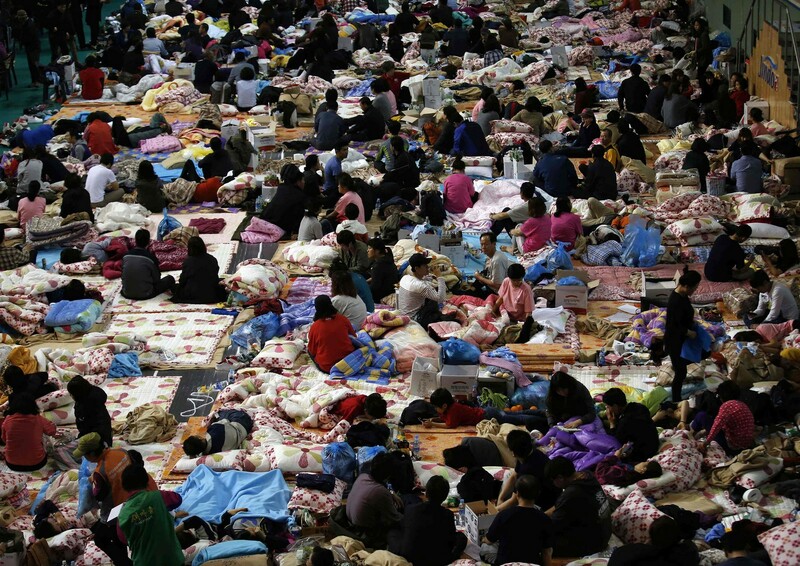 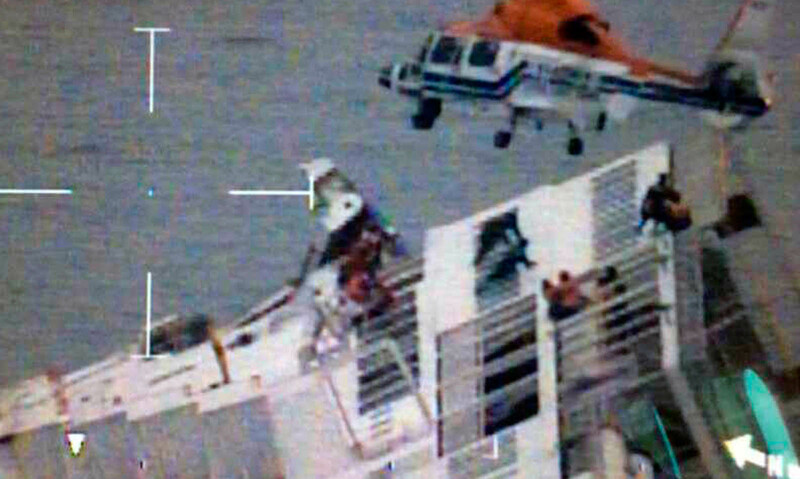 So far 179 people have been rescued, 28 found dead and 268 are still missing. 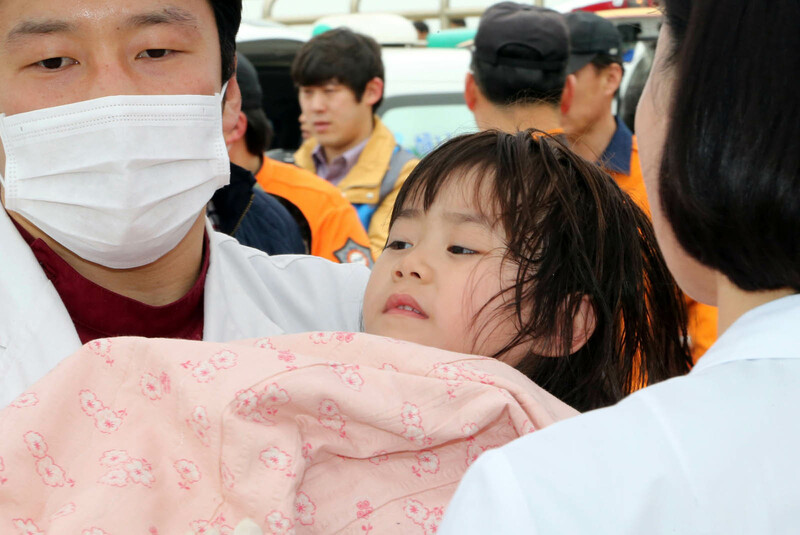 "Children are dying. 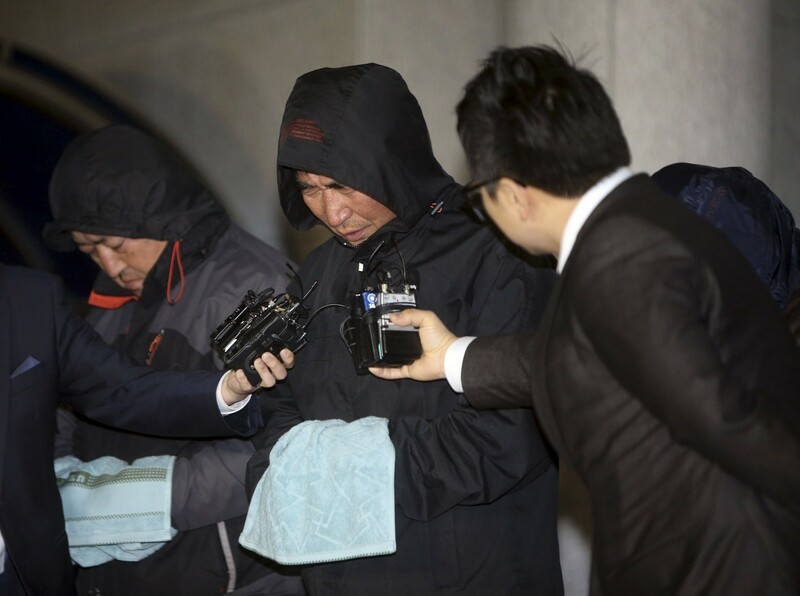 Get Park Geun Hye on the line!" 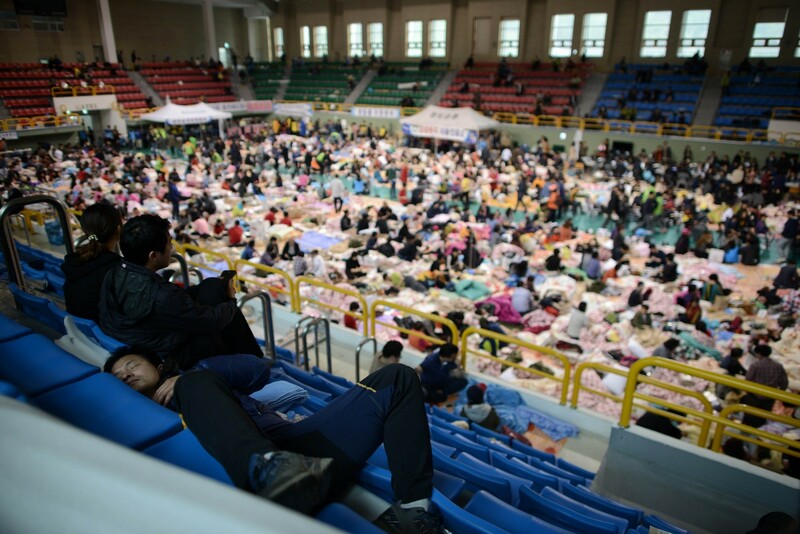 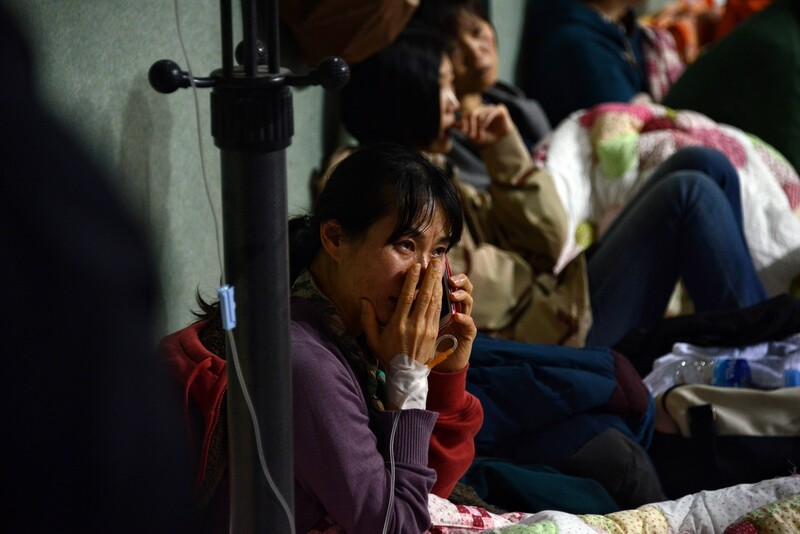 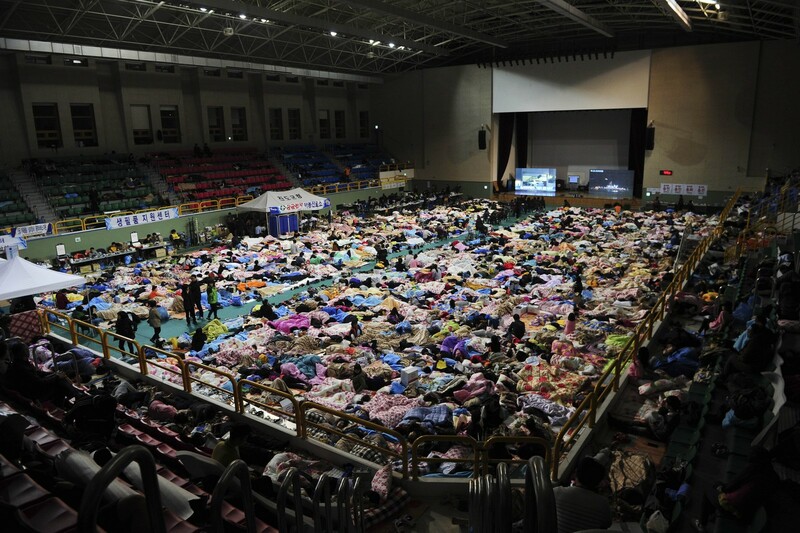 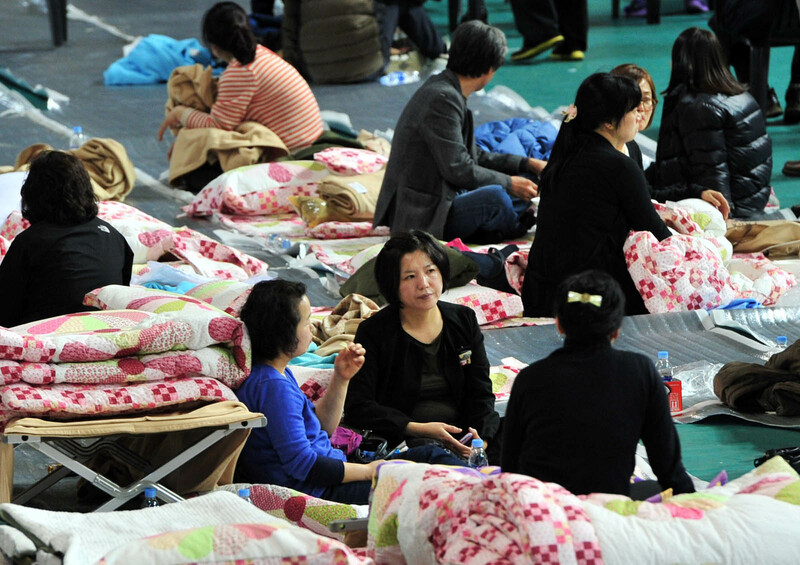 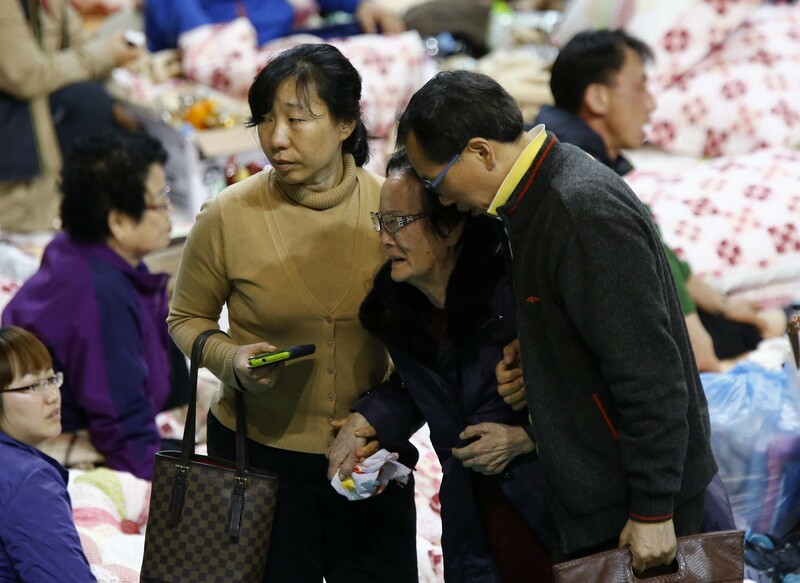 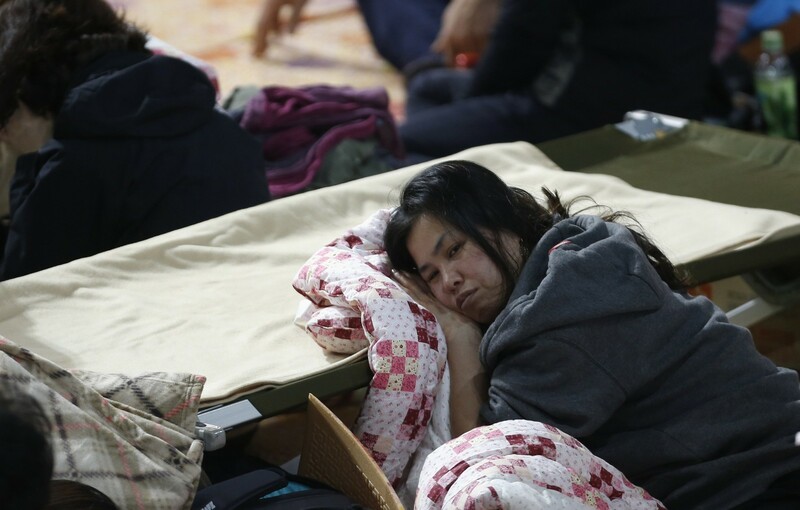 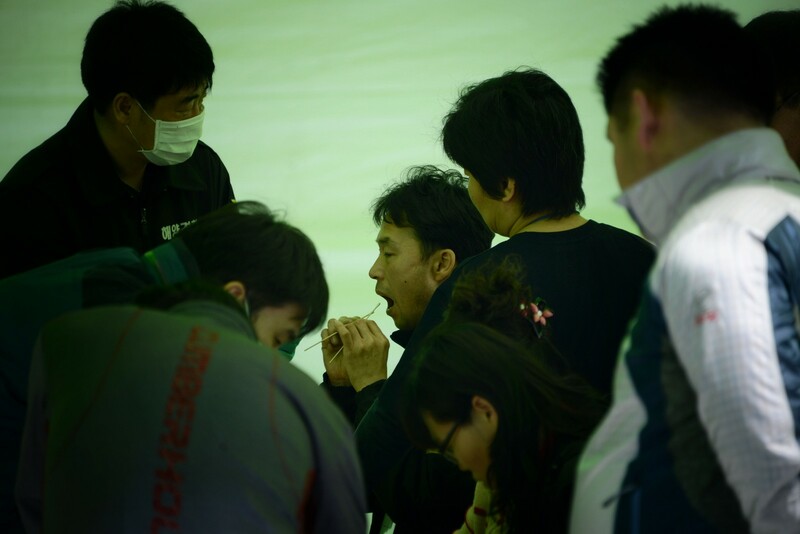 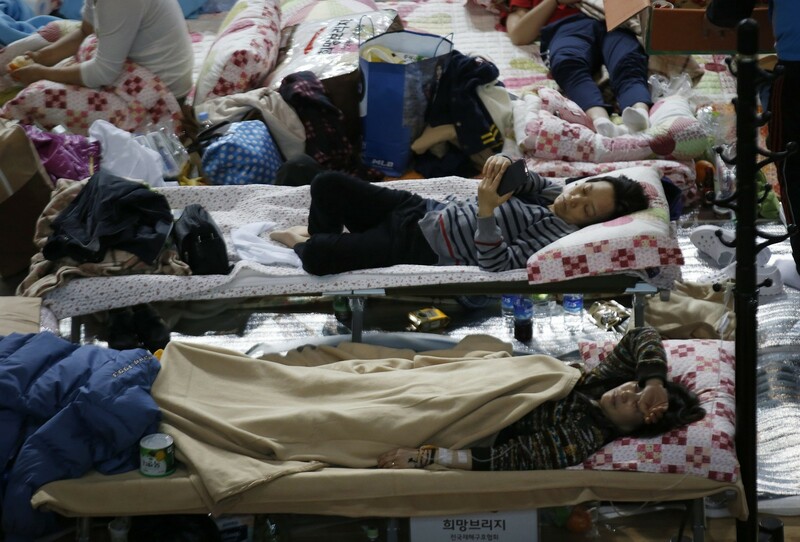 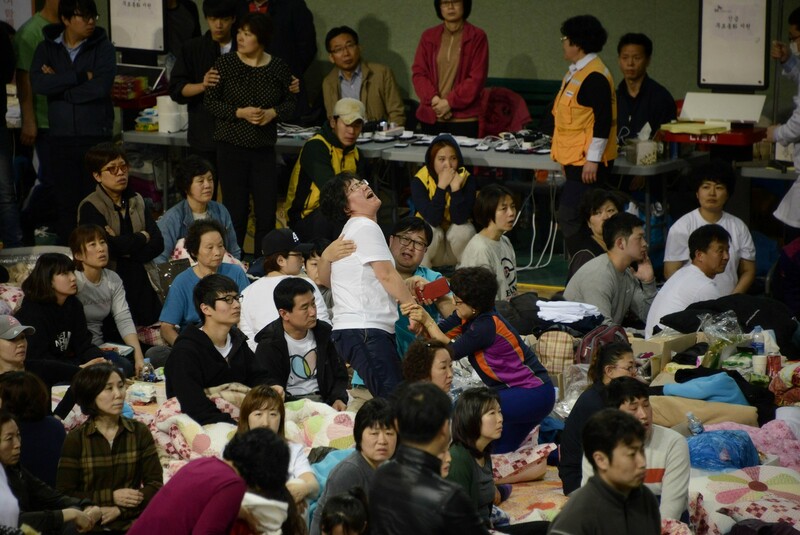 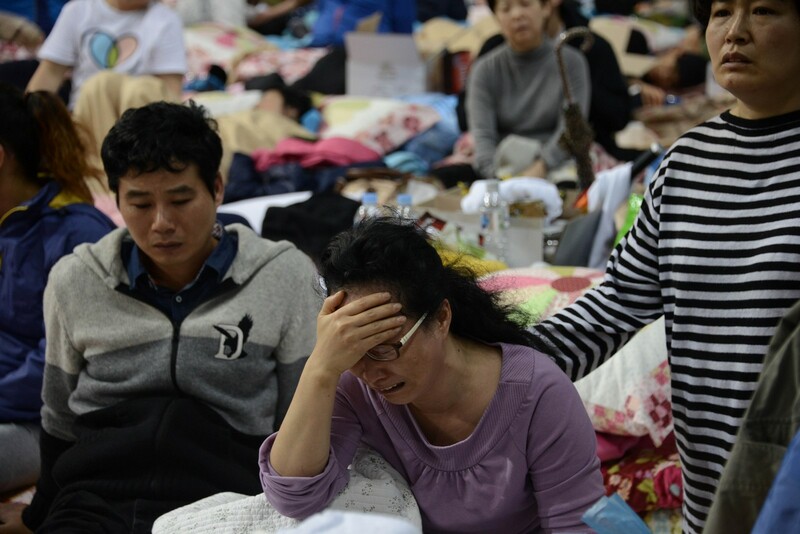 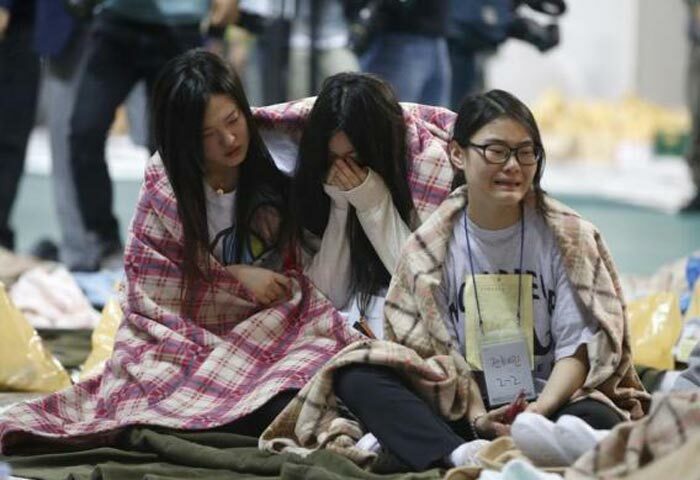 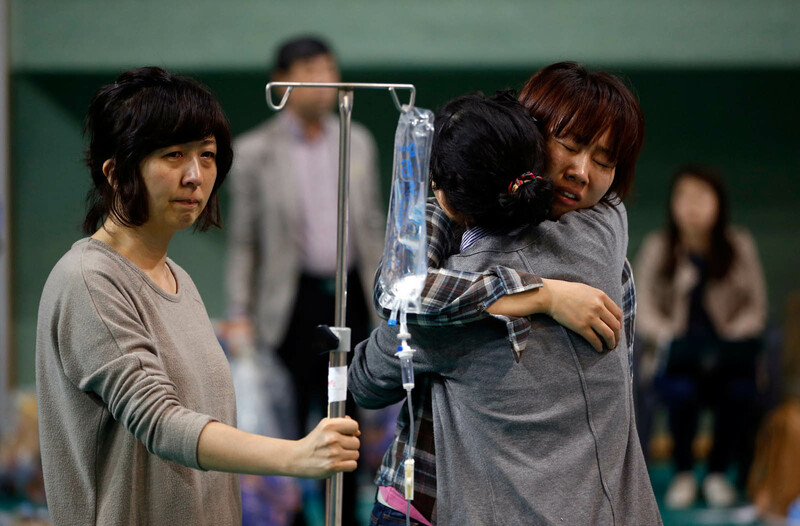 demanded an emotional mother, one of the hundreds gathered at the indoor gymnasium that is serving as a temporary shelter for the families anxiously awaiting the latest news about their loved ones. 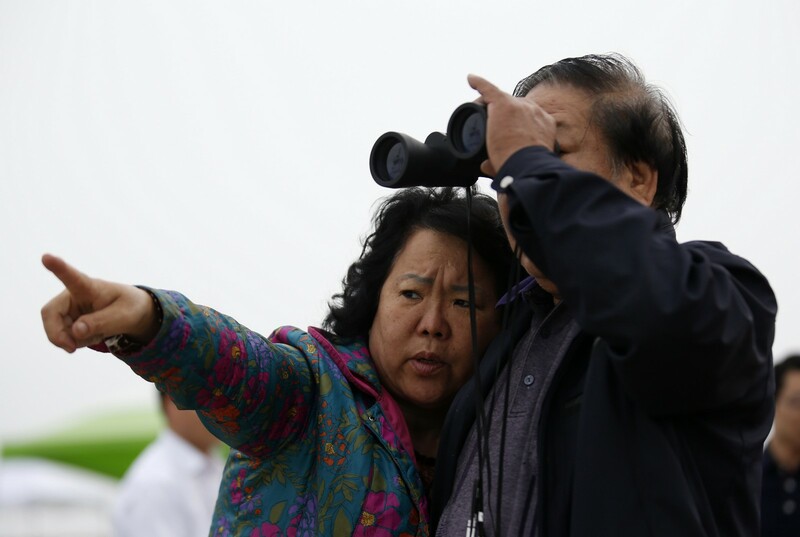 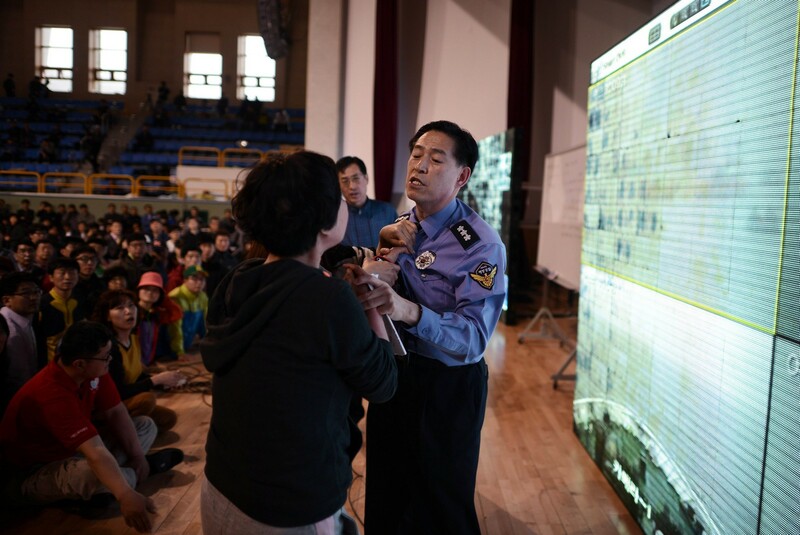 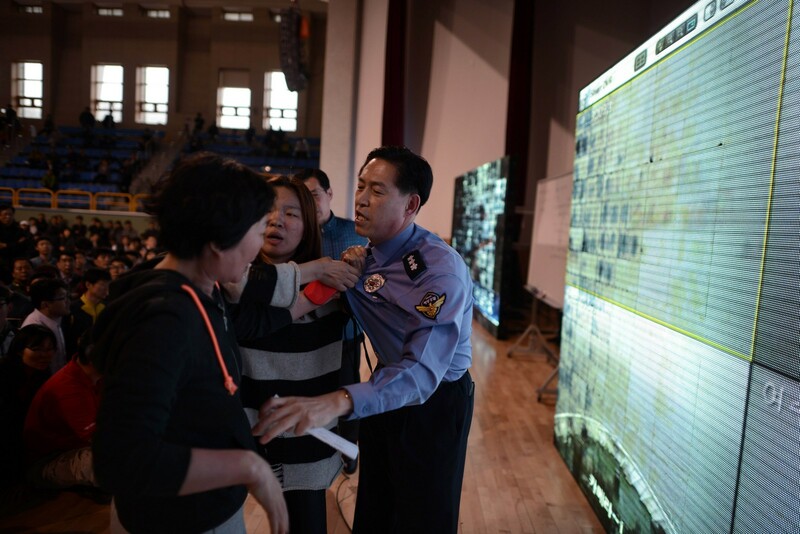 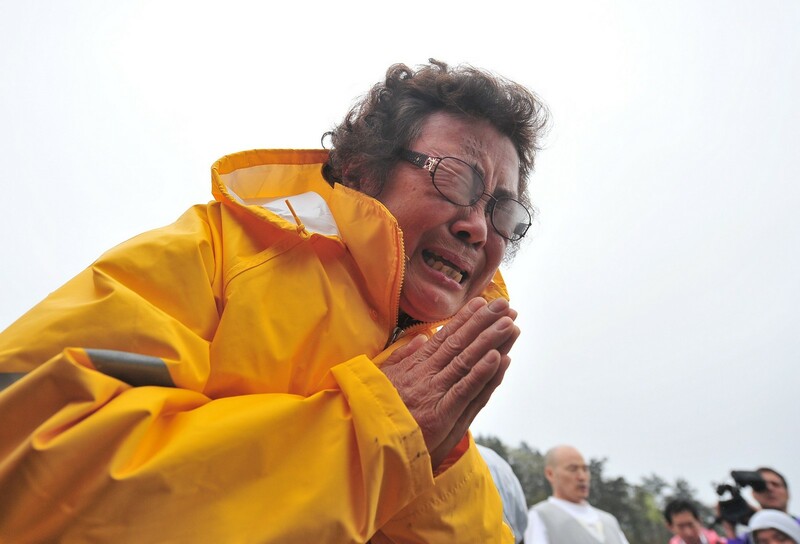 As the woman yelled her demand into a microphone, the Coast Guard officials who had been on the stage since morning to brief the families on latest developments stood by silently, their heads down. 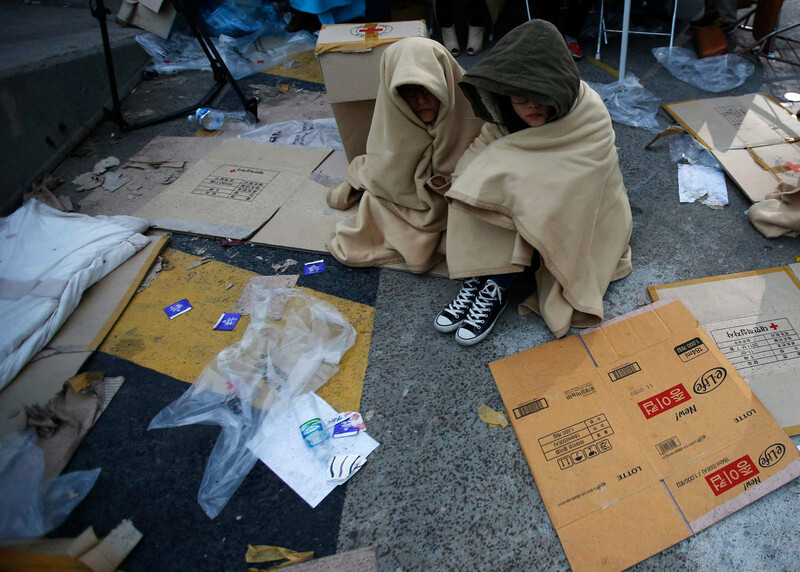 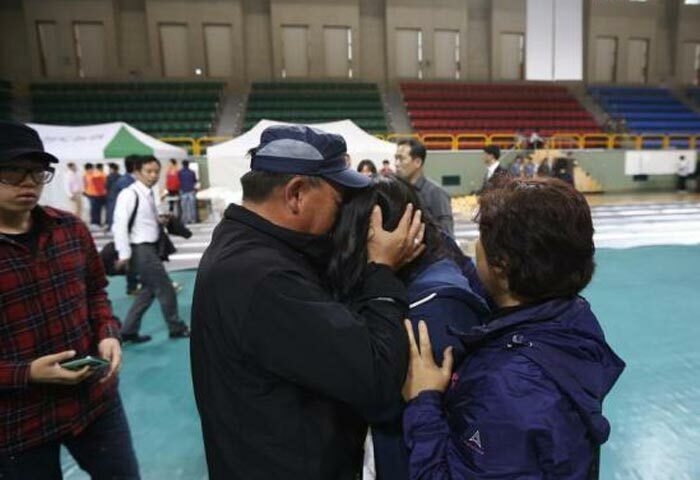 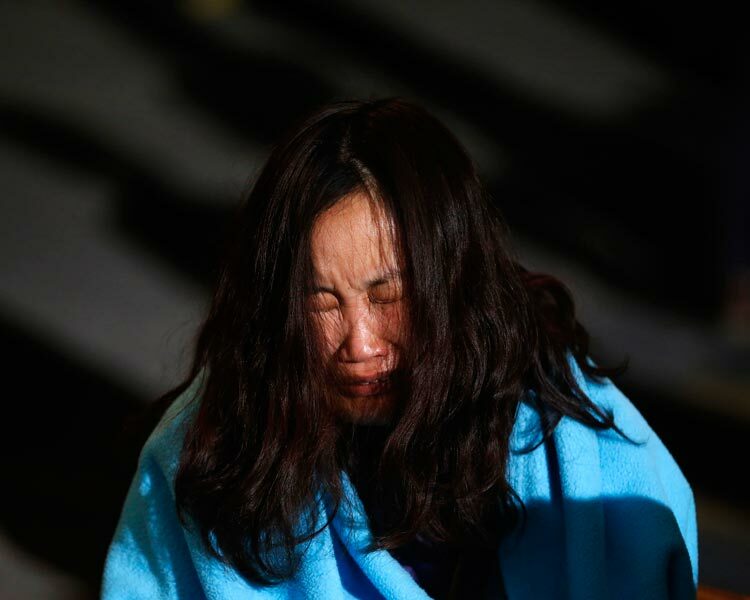 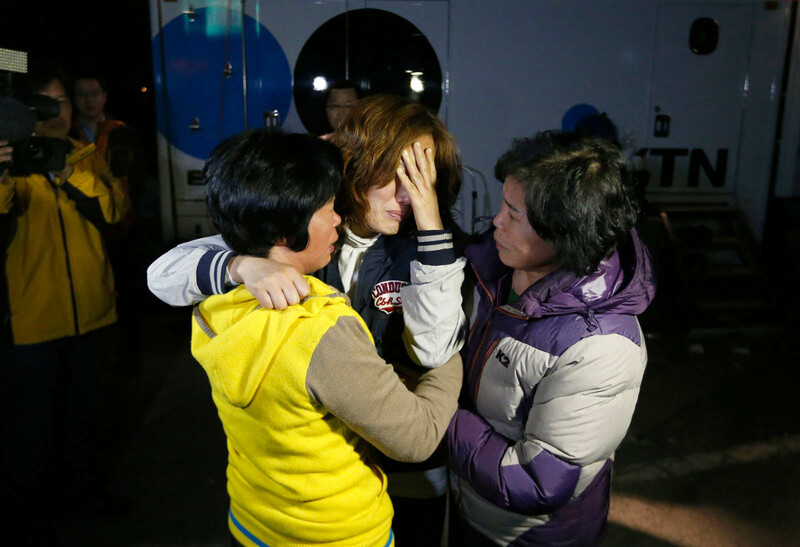 Ms Park was on the scene on Thursday reassuring the families that the government would do everything it could to rescue the children. 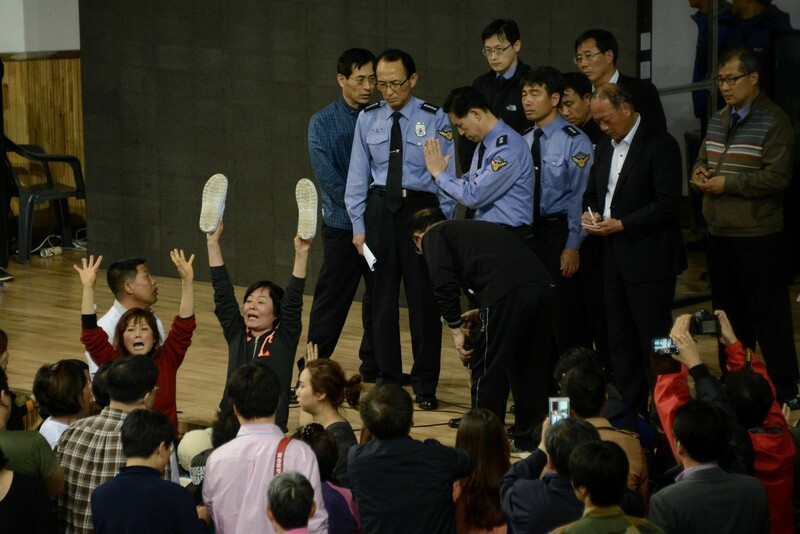 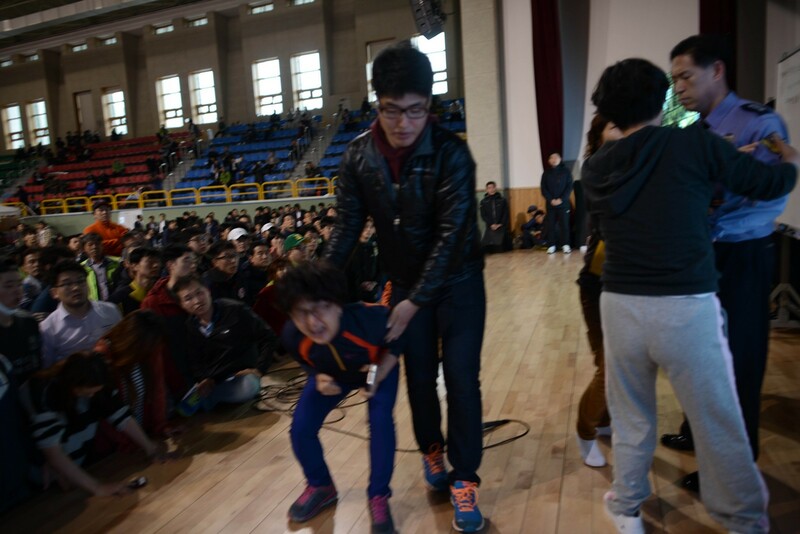 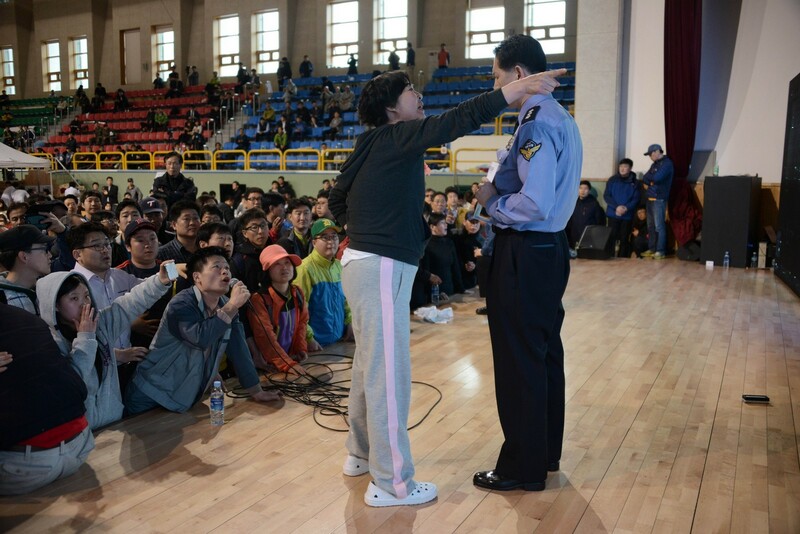 Soon, the mother was urging everyone in the gymnasium to get up and demand that Ms Park get on live camera with the people in the gymnasium. 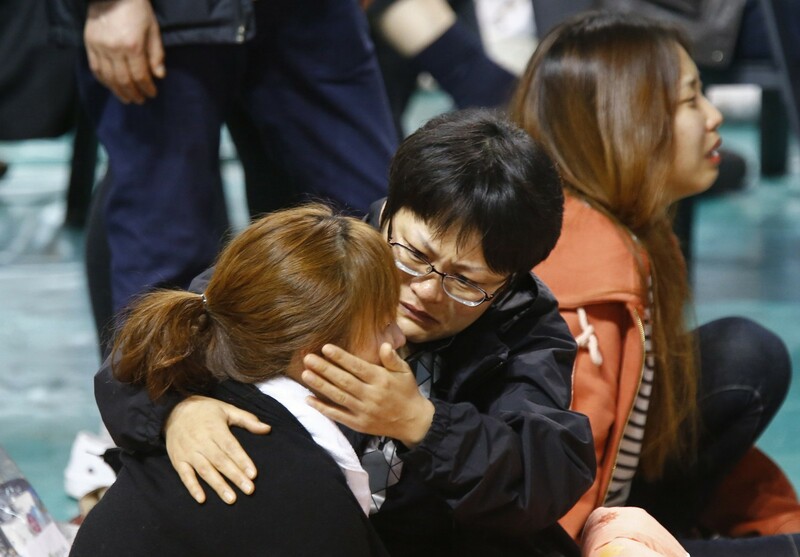 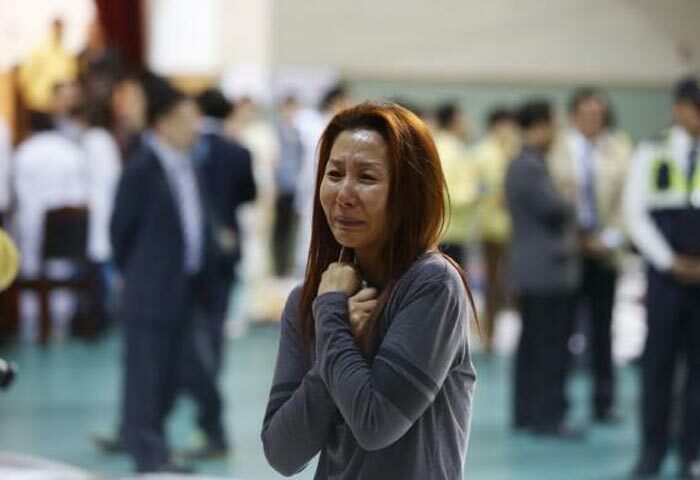 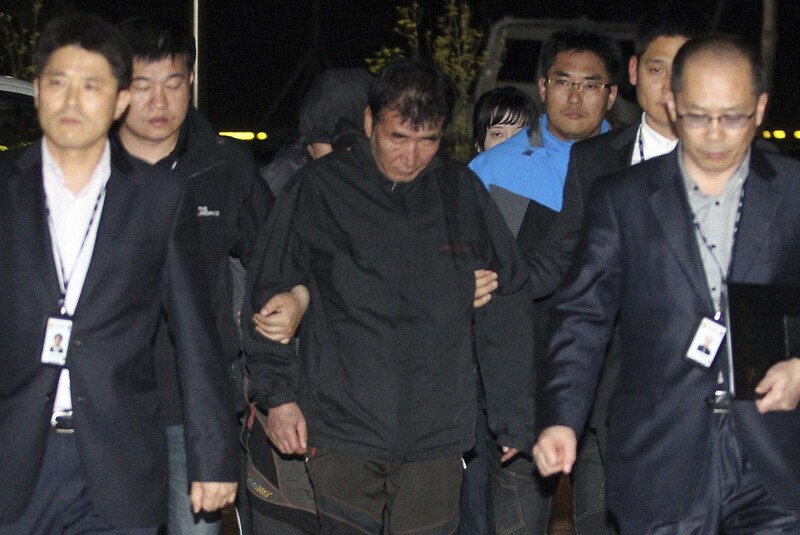 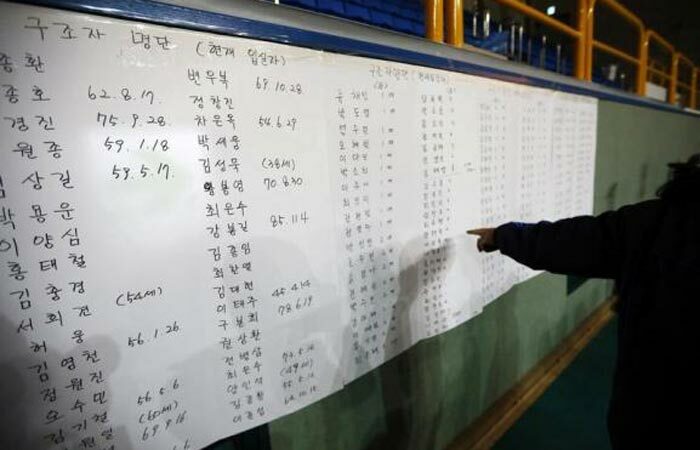 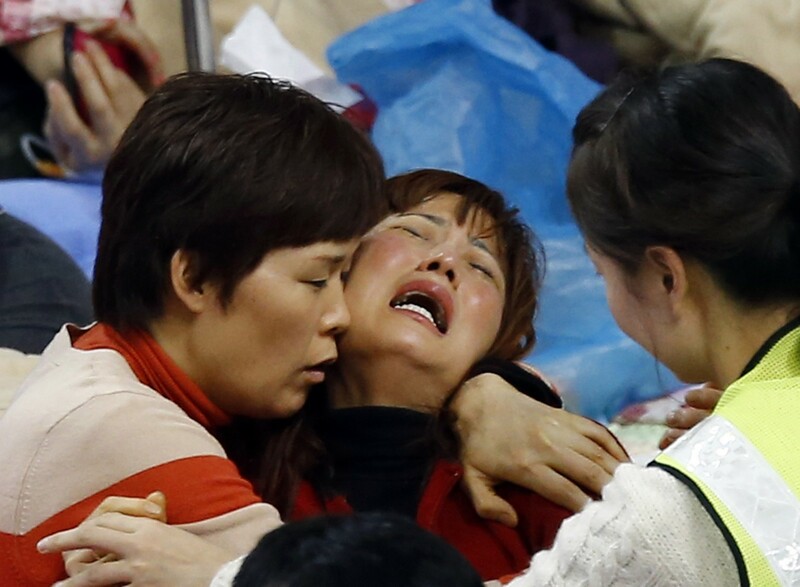 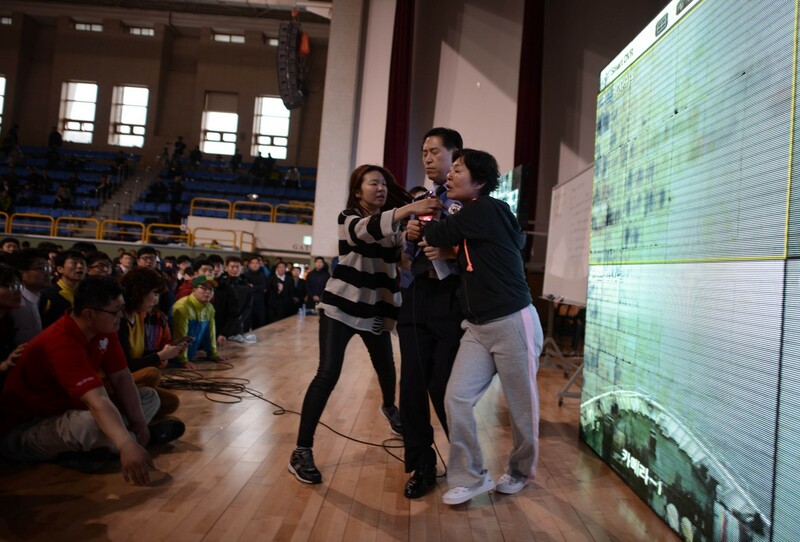 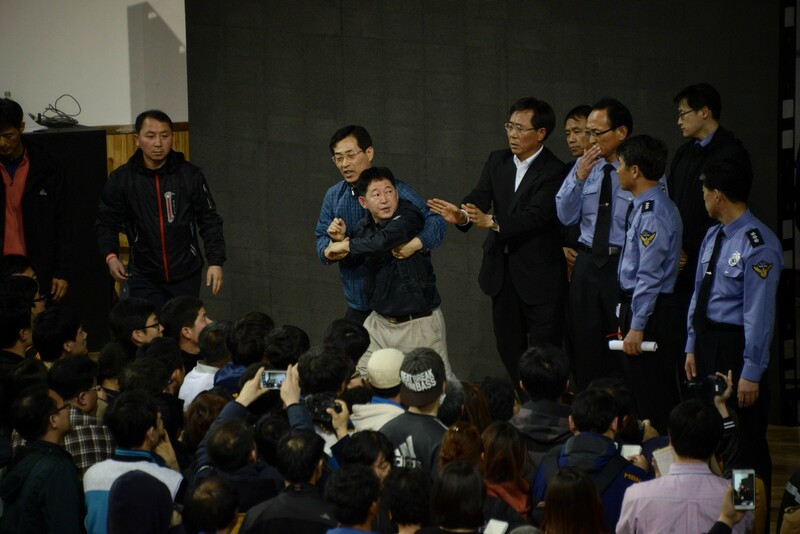 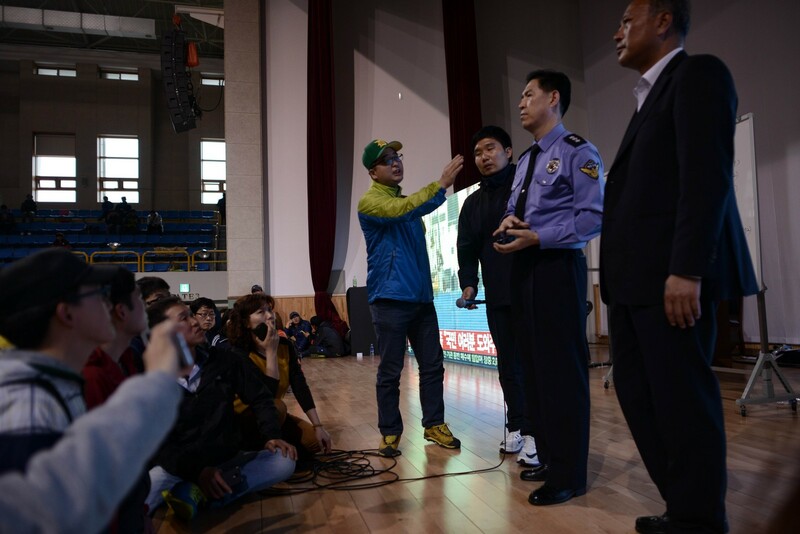 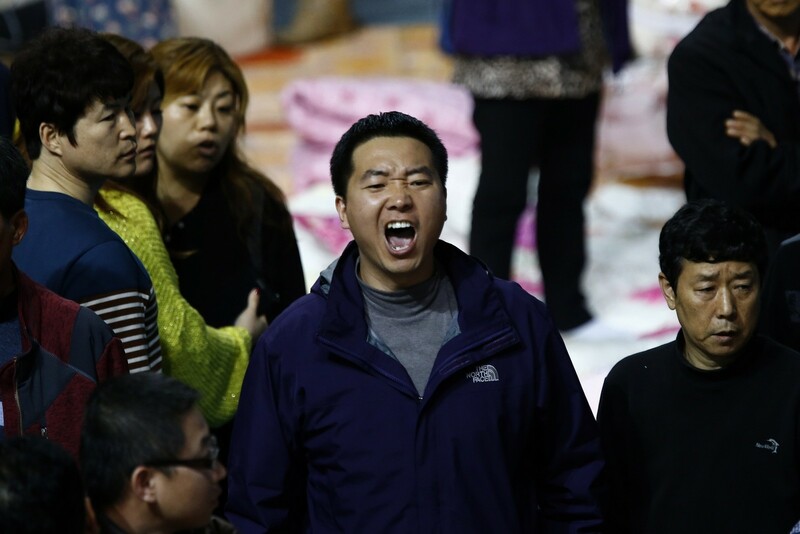 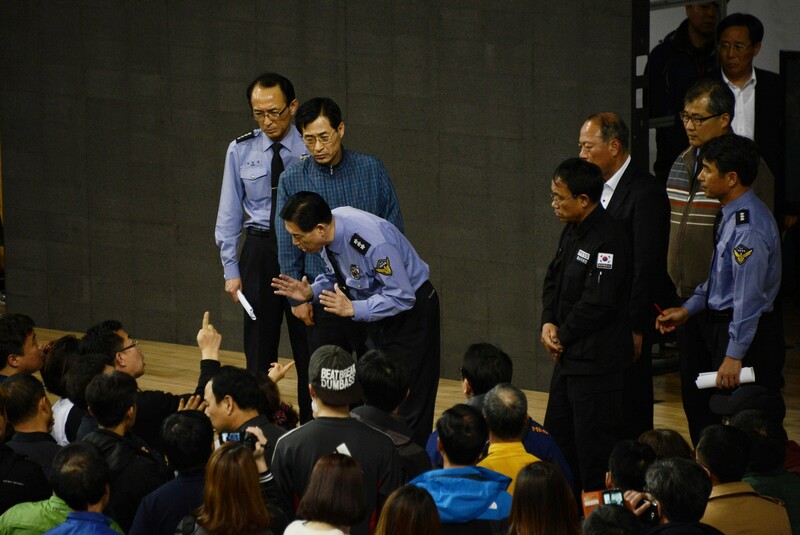 She and the families also demanded that the scene inside the gym be broadcast live. 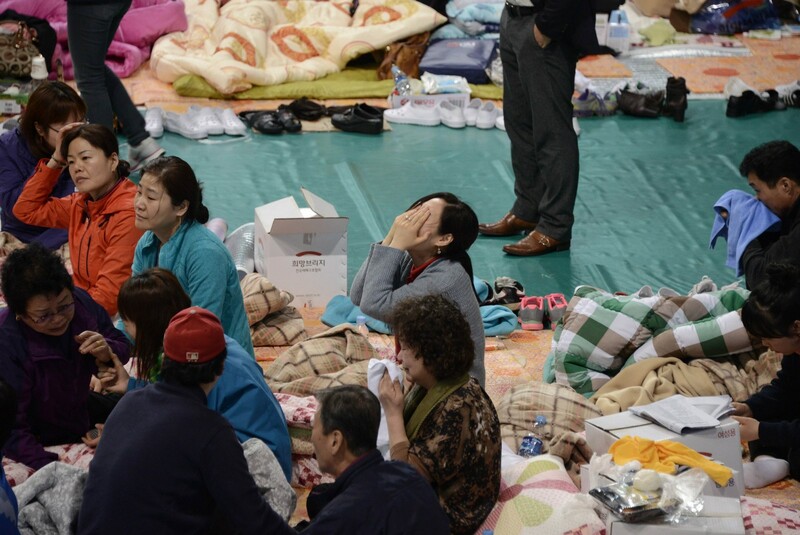 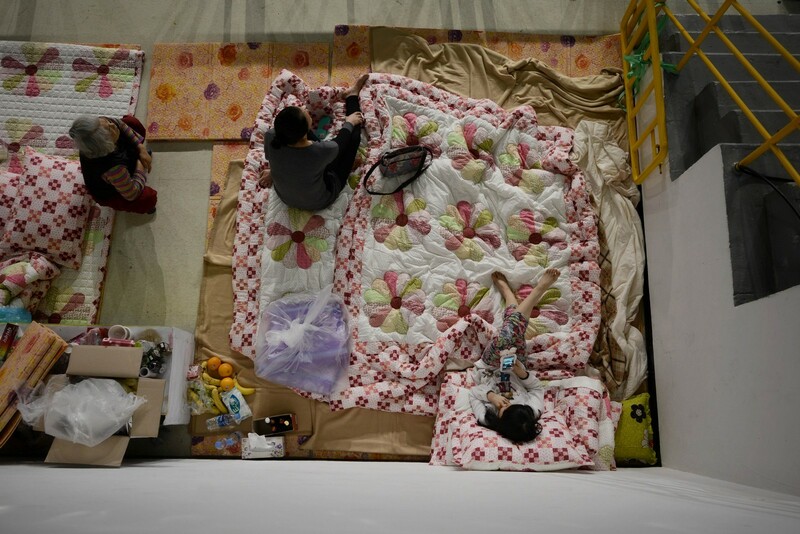 The fighting among families in the gym added to the mayhem. 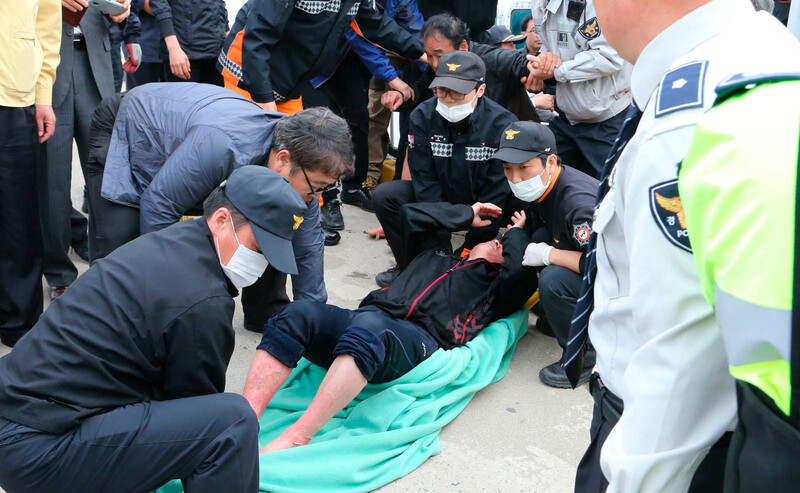 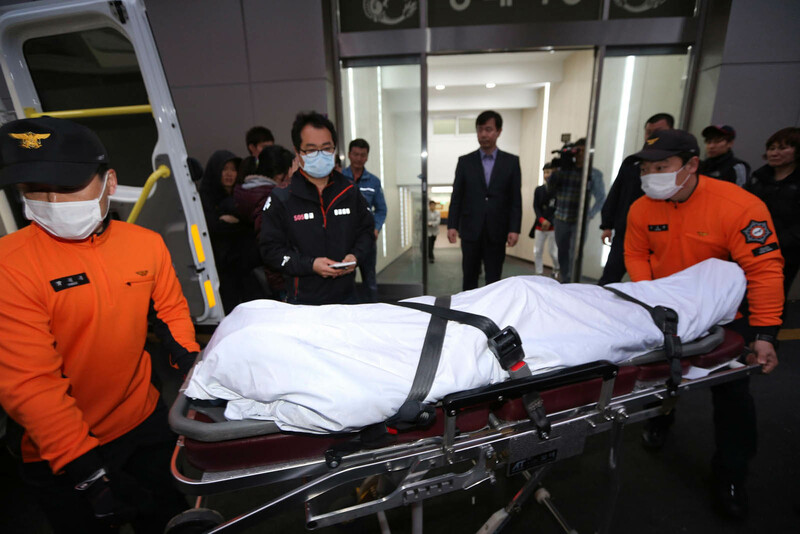 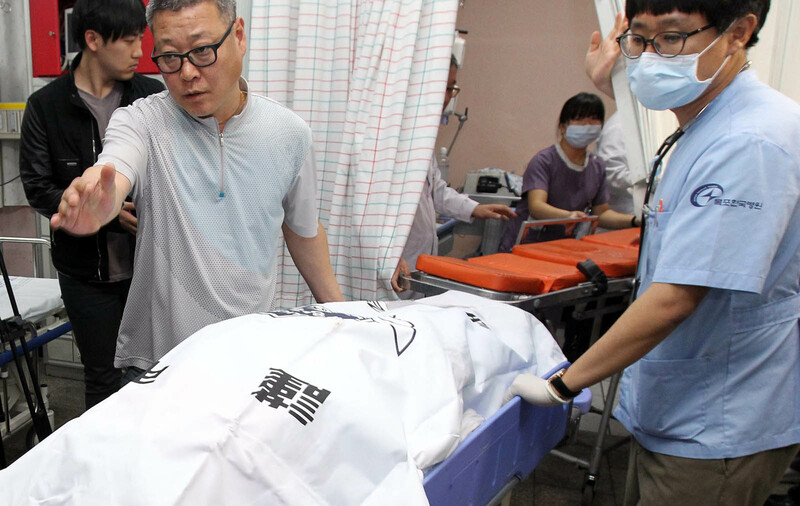 Earlier, an announcement by another family member that an autopsy of a recovered body showed that the person had died just a few minutes earlier set off a loud wail. 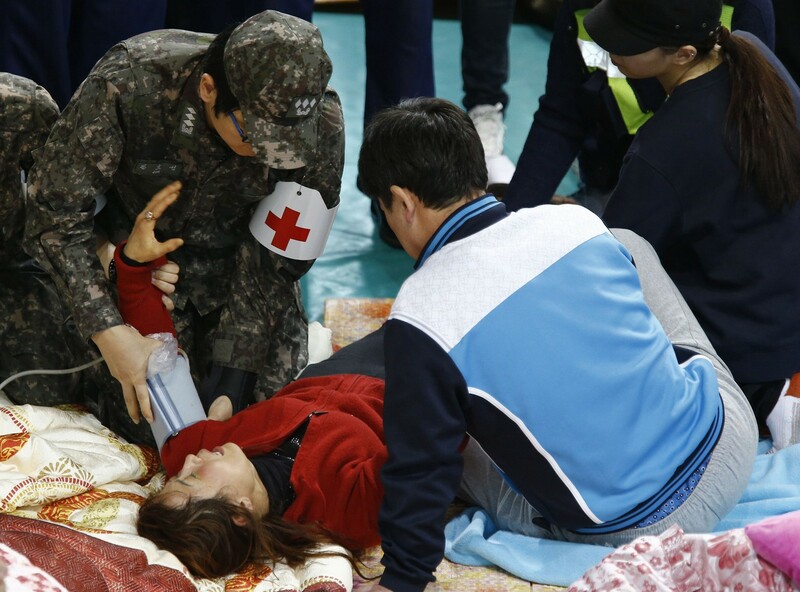 Throughout the day, people were carried out in stretchers by military medics, succumbing to frayed nerves and exhaustion. 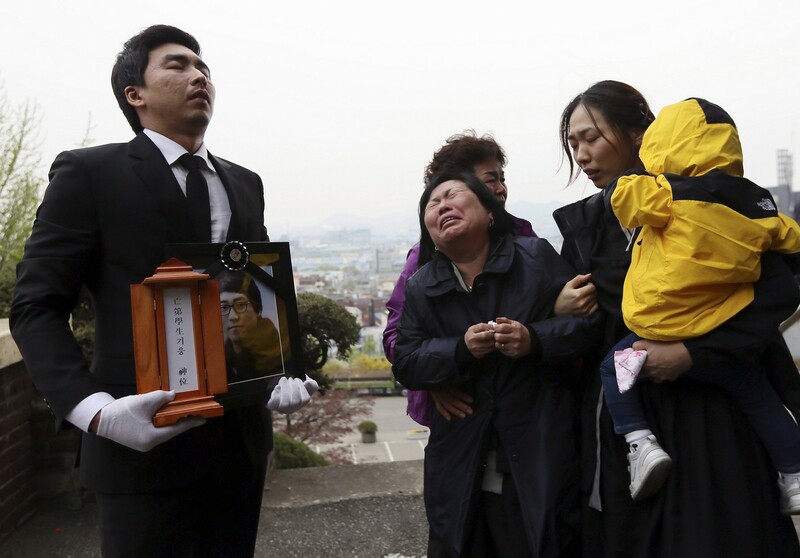 The already bad situation was further worsened by the families' distrust of briefings by government officials. 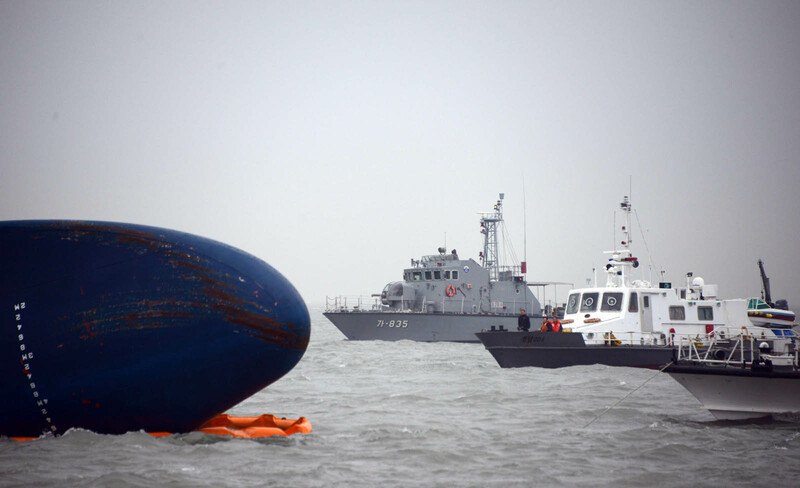 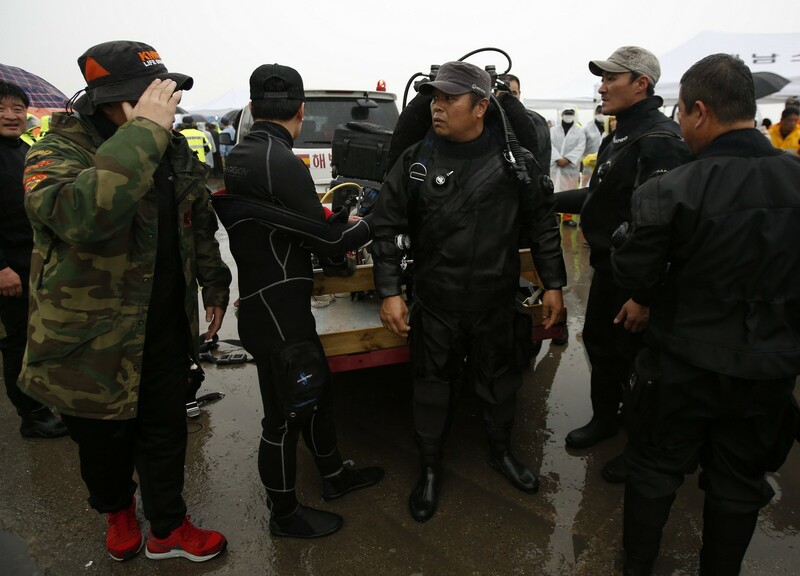 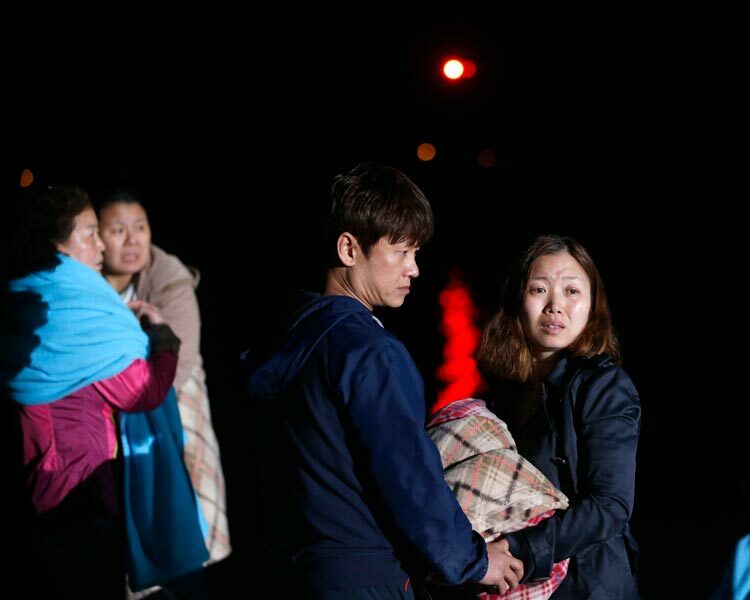 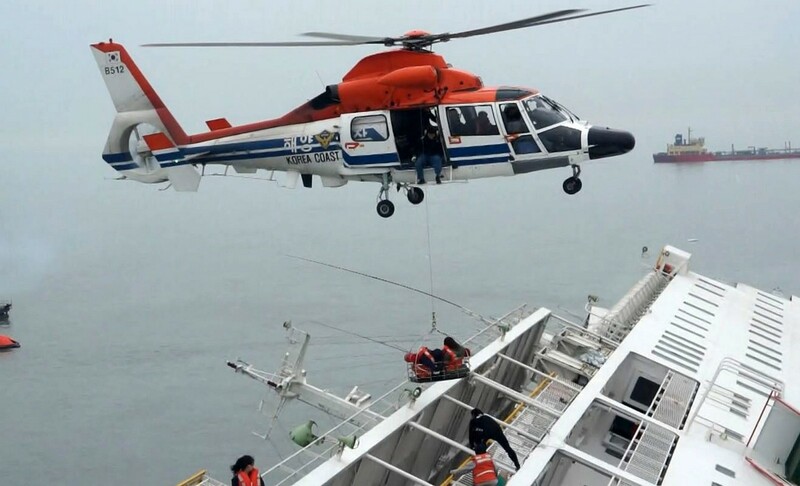 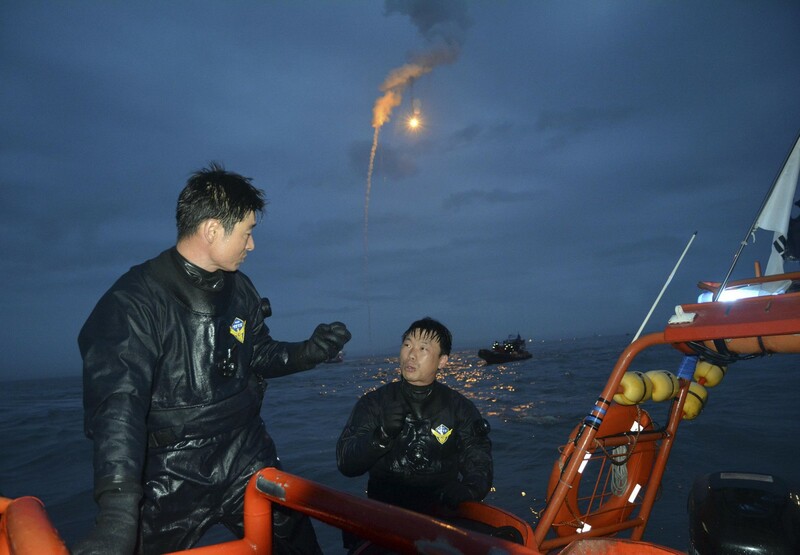 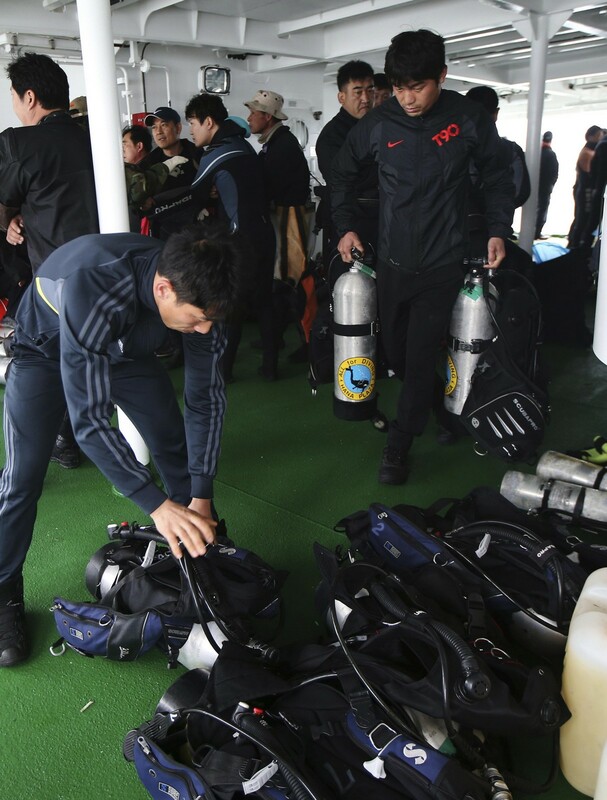 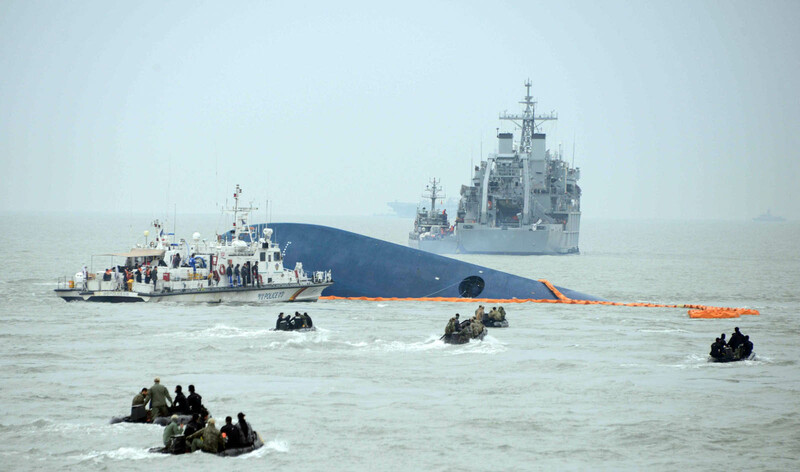 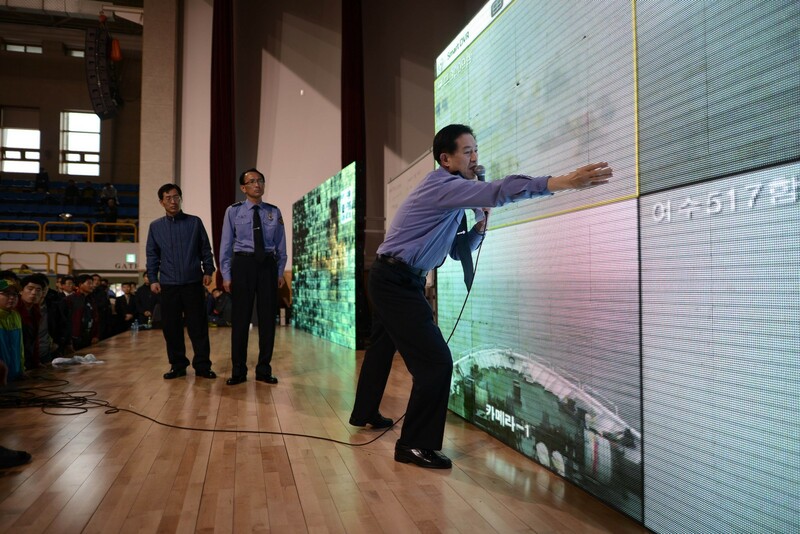 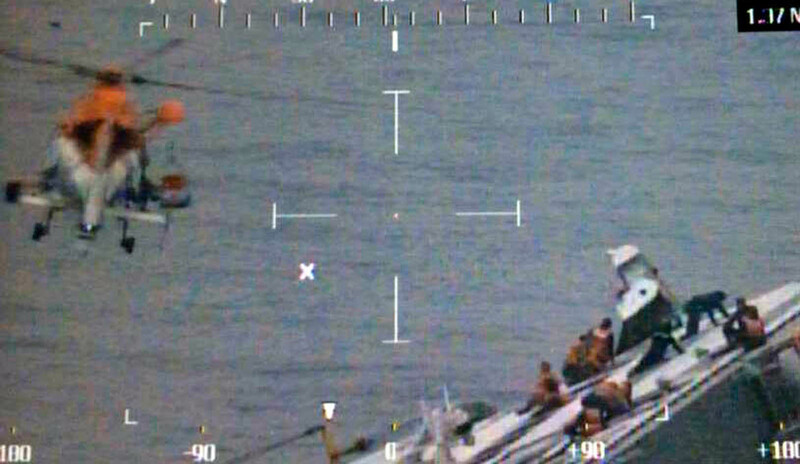 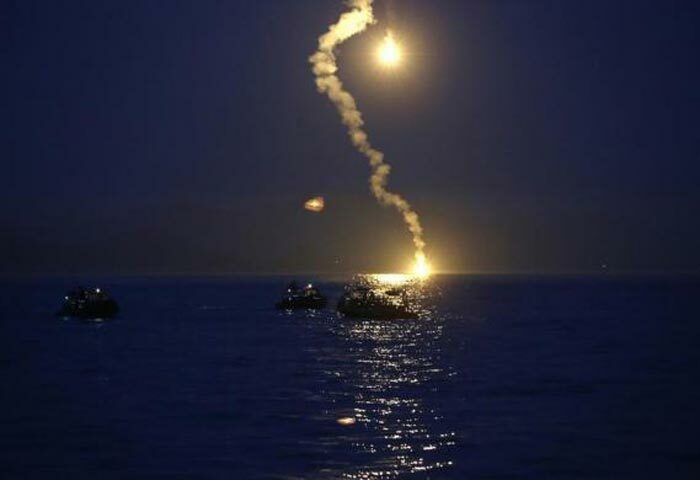 With its initial underestimation of the magnitude of the disaster, the government scrambled to respond to the maritime disaster, garnering distrust from the families. 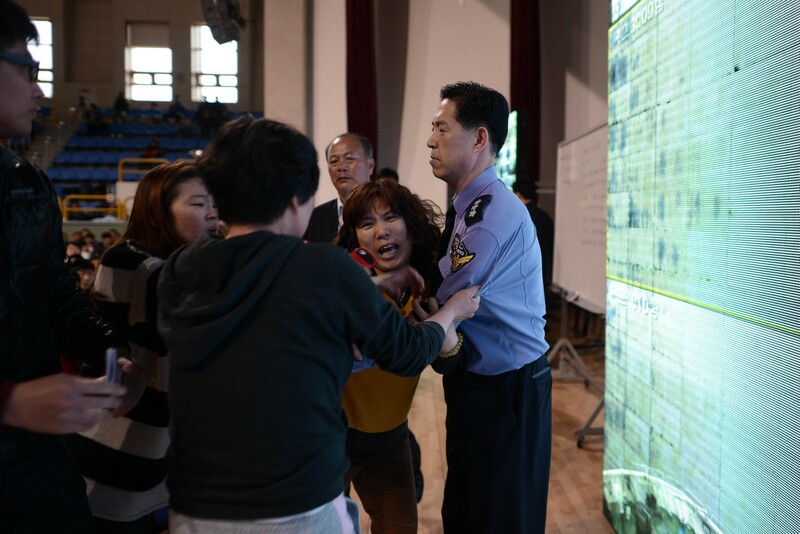 Conspiracy theories run amok as highly agitated mothers, fathers and other family members could not be convinced that the authorities were doing their job. 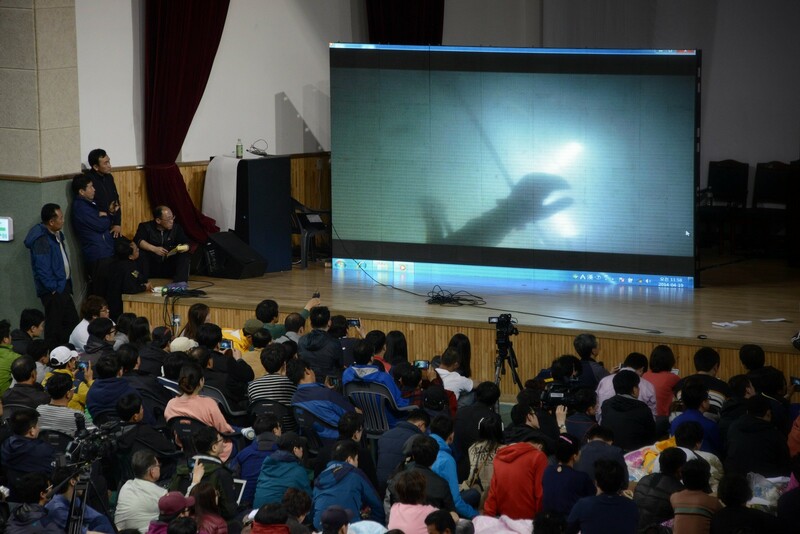 The distrust and conspiracy theories are fueled in part by the inefficiency on the part of the government - it was only late morning before an official from the Coast Guard took to the stage offering regular briefings and answering families' questions. 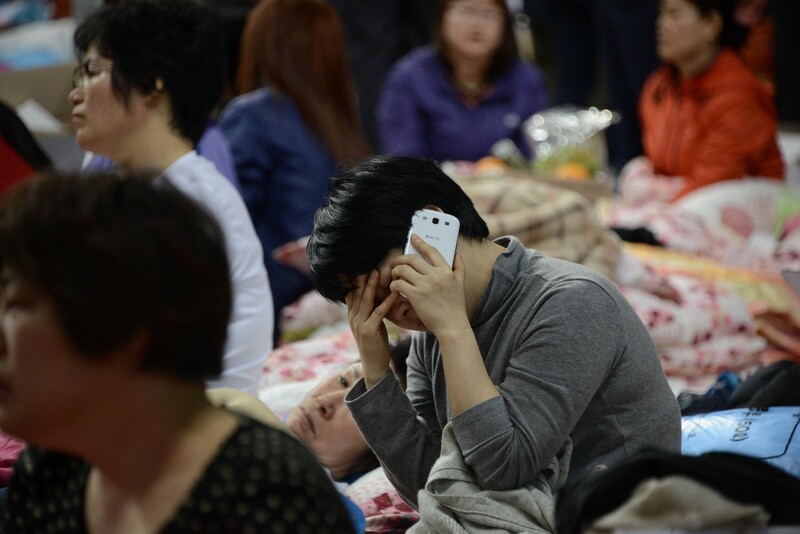 Unconfirmed facts reported real-time by the media and distributed through SMS also added to the rumours and false information, making the already very difficult situation for the grieving families much worse.